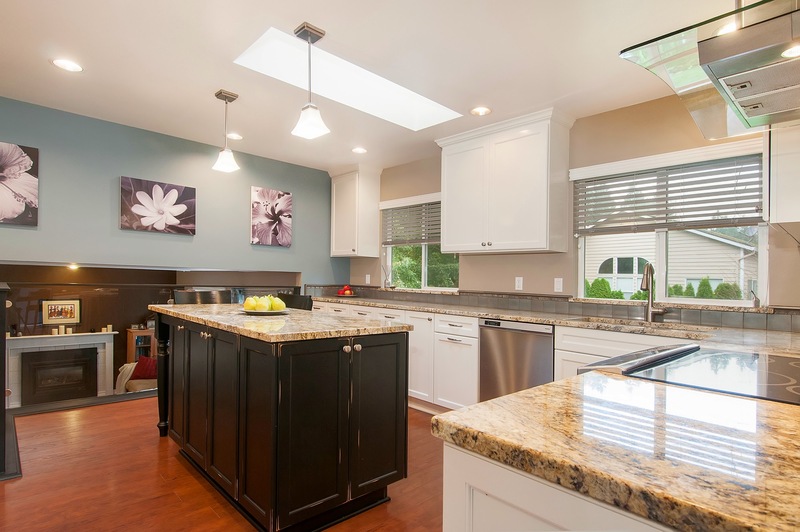 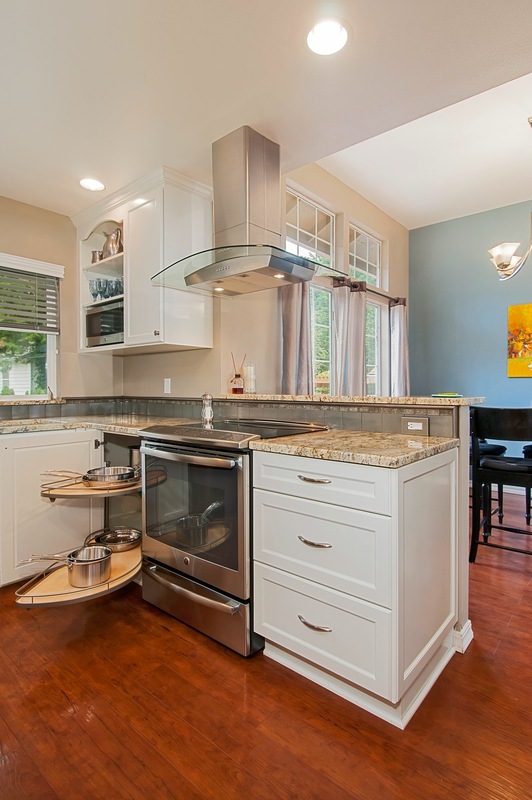 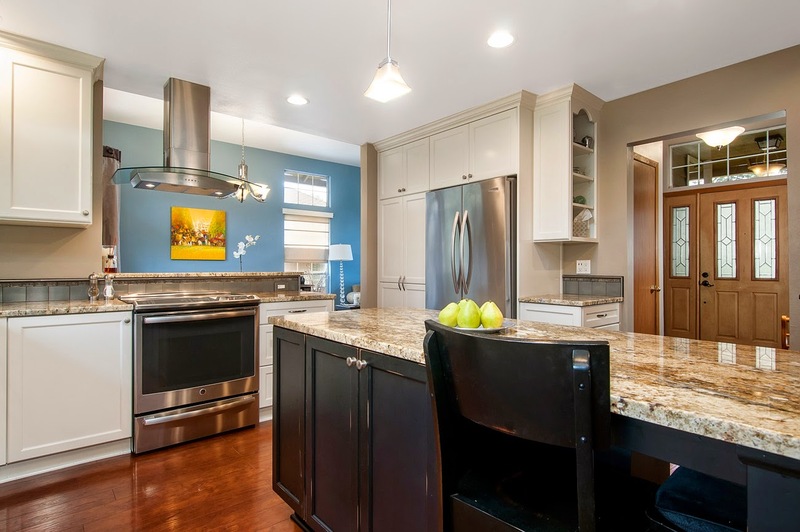 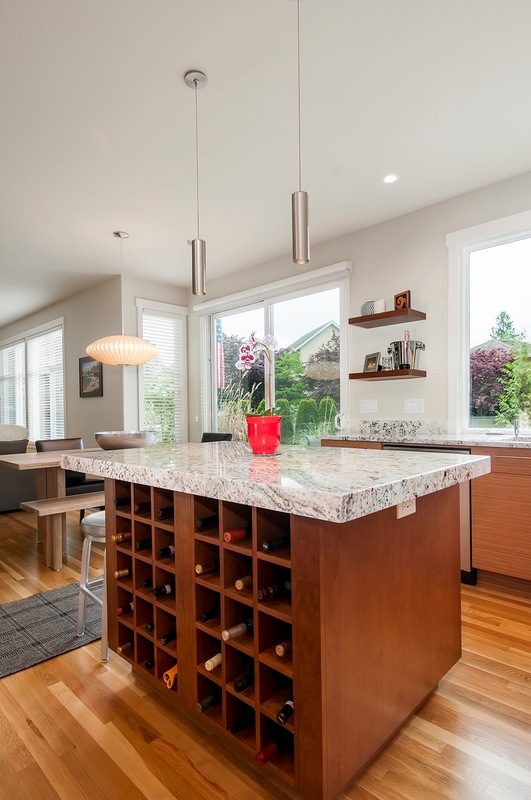 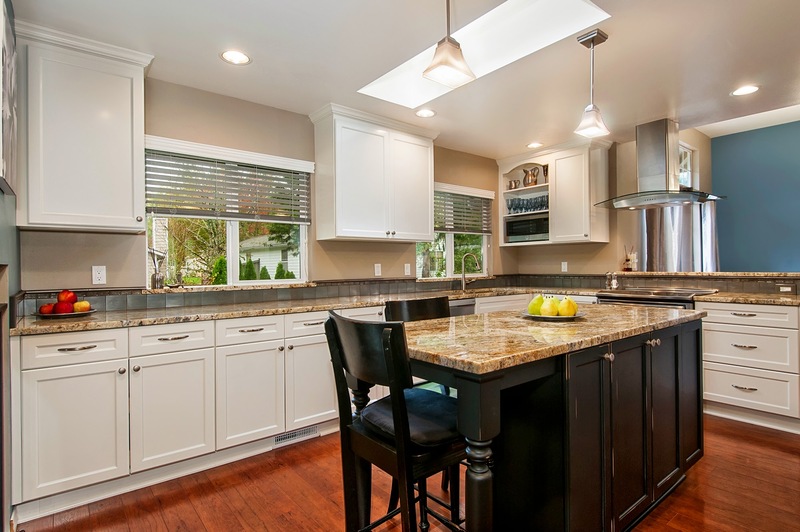 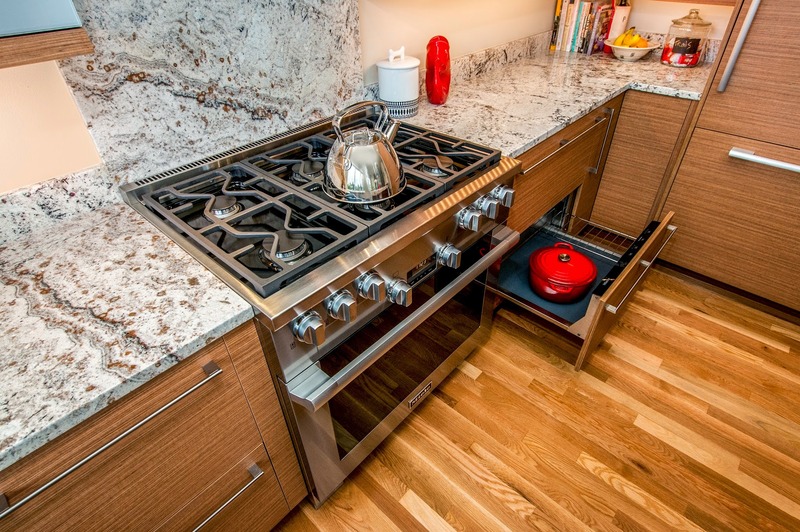 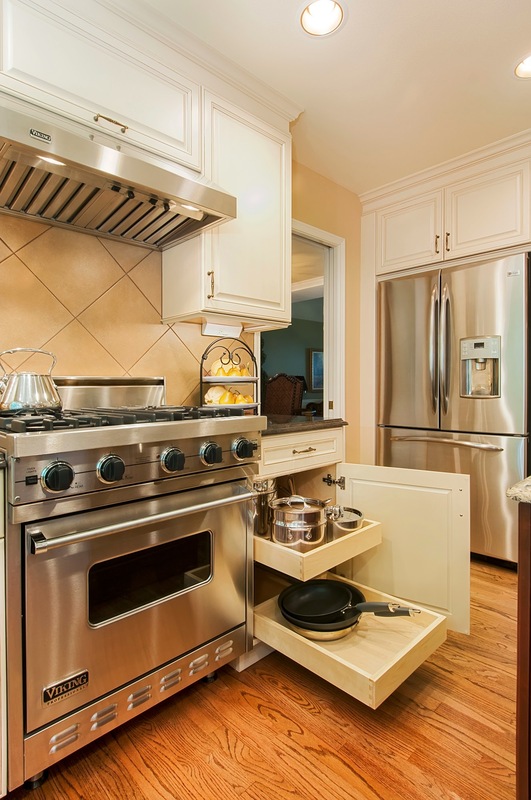 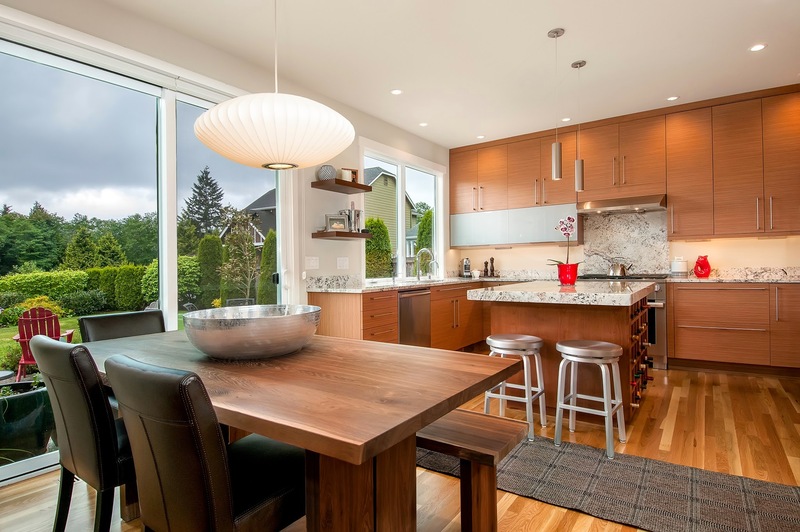 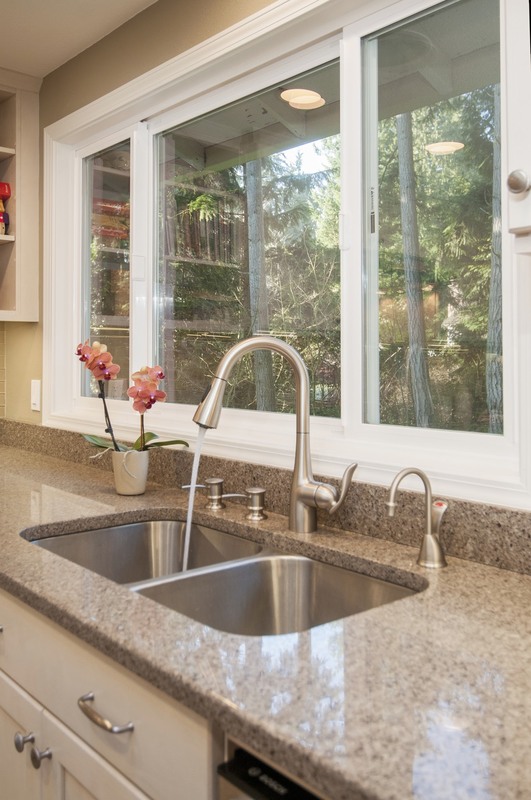 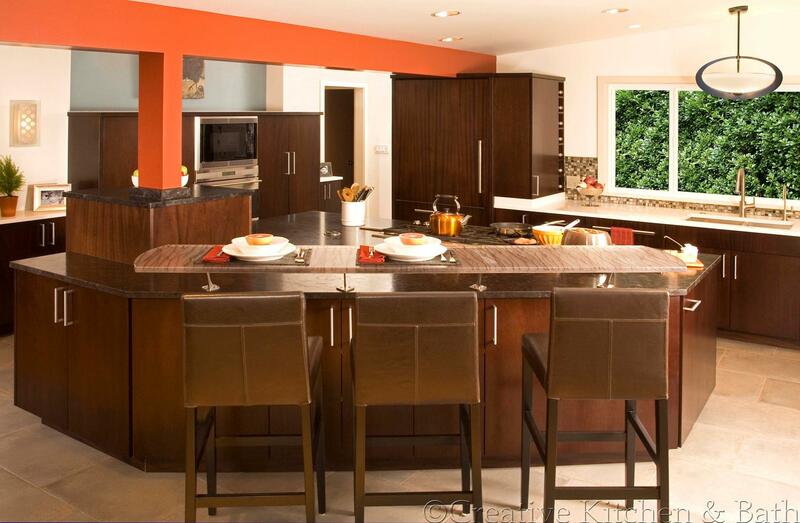 FEATURED on HOUZZ - "Kitchen of the Week," this kitchen is all about value-added design. 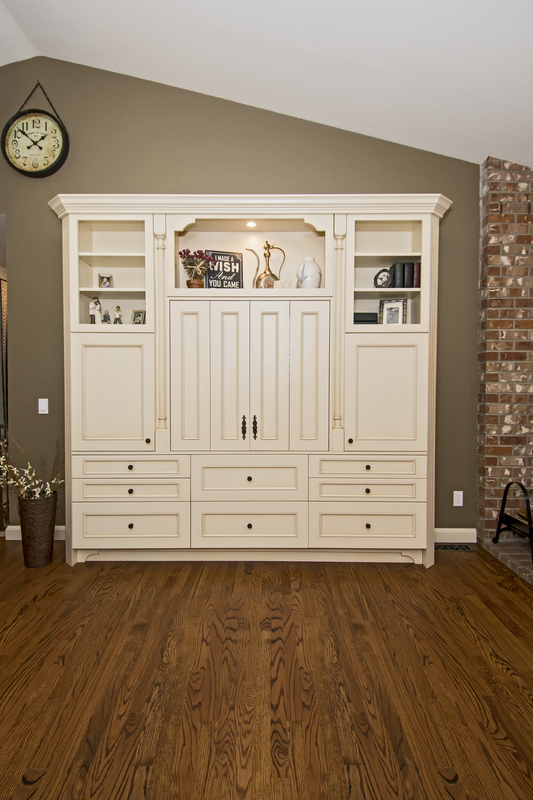 Check out the feature story HERE for the details. 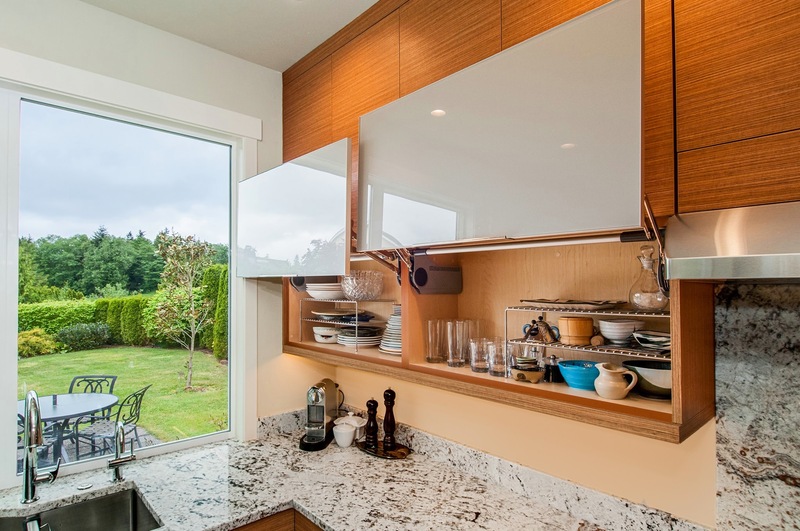 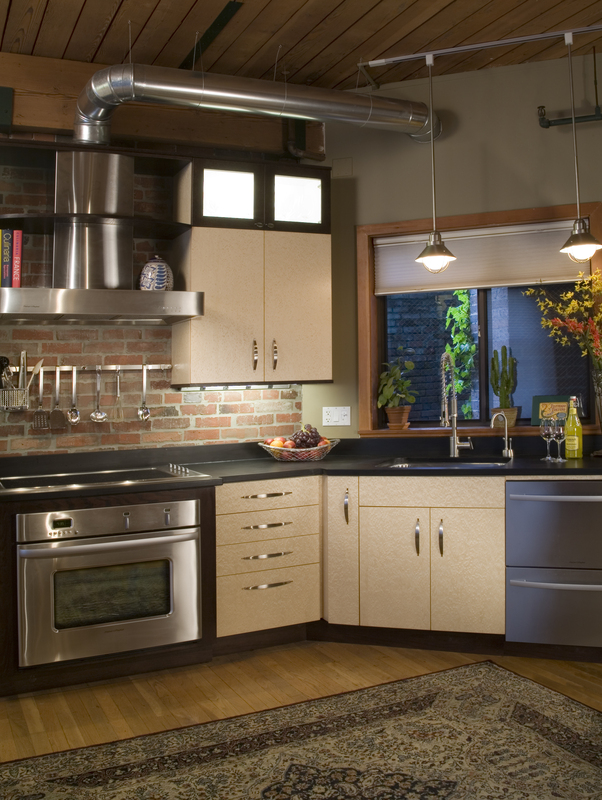 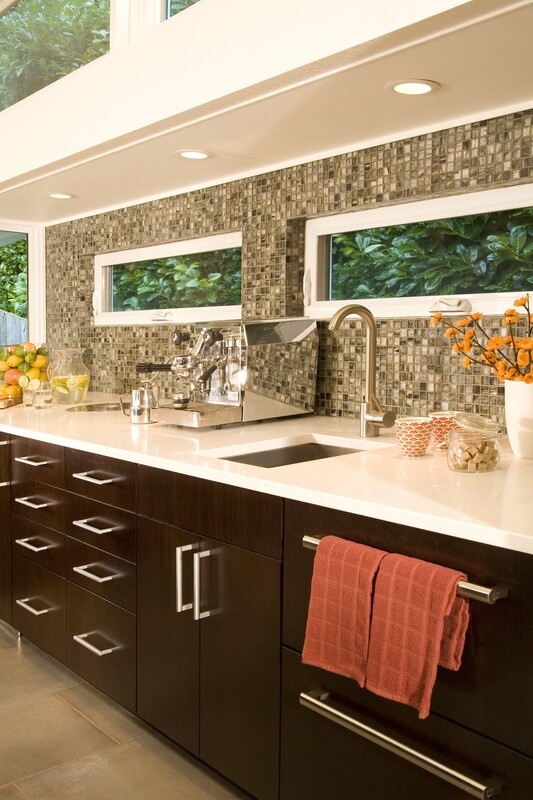 Contemporary custom cabinets by Bellmont Cabinetry in combination with metal accents, glass tip-up doors, and clean lines give this kitchen a stylish and stunning appeal. 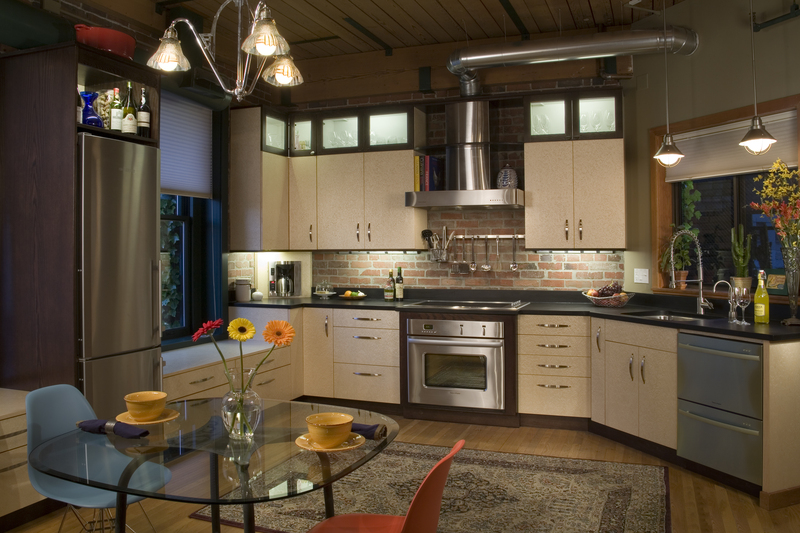 The goal of the design for this award-winning kitchen was to improve the function of the 1913 loft while being true to it's beauty and history. 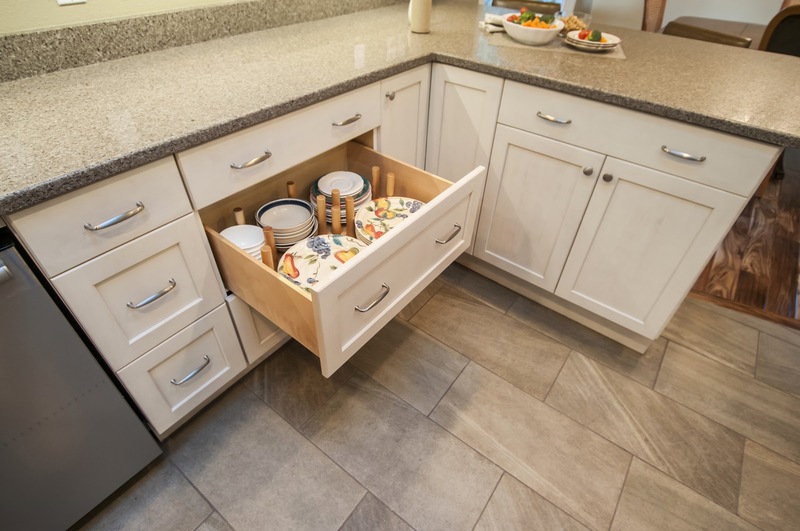 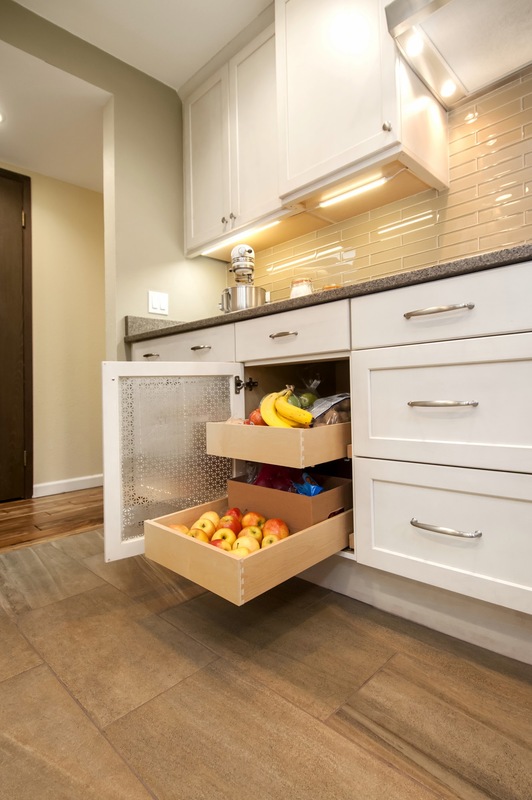 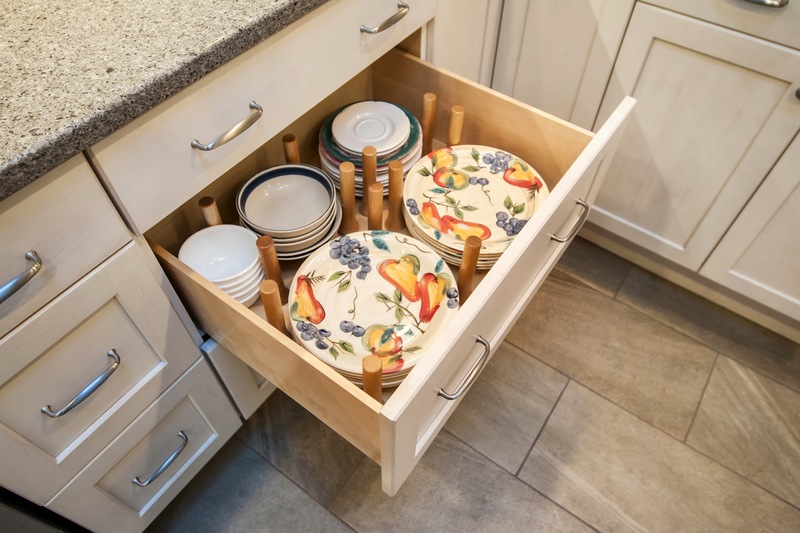 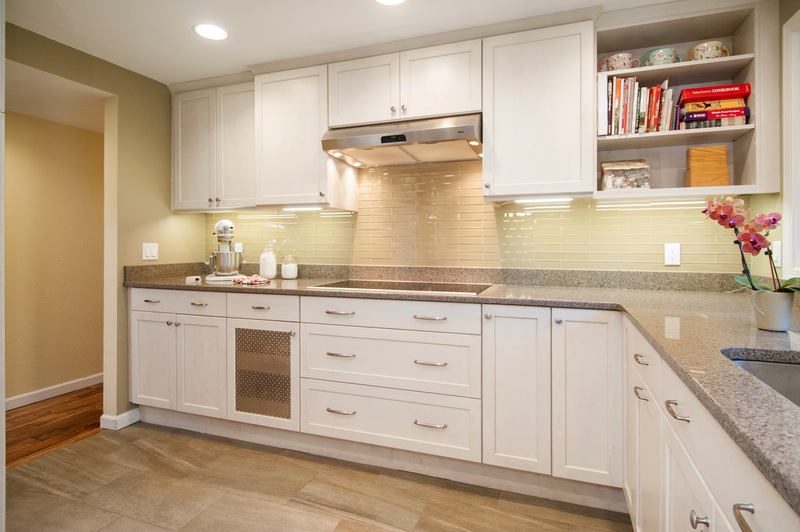 Light-colored cabinets, accent lighting, and functional storage achieve these goals. 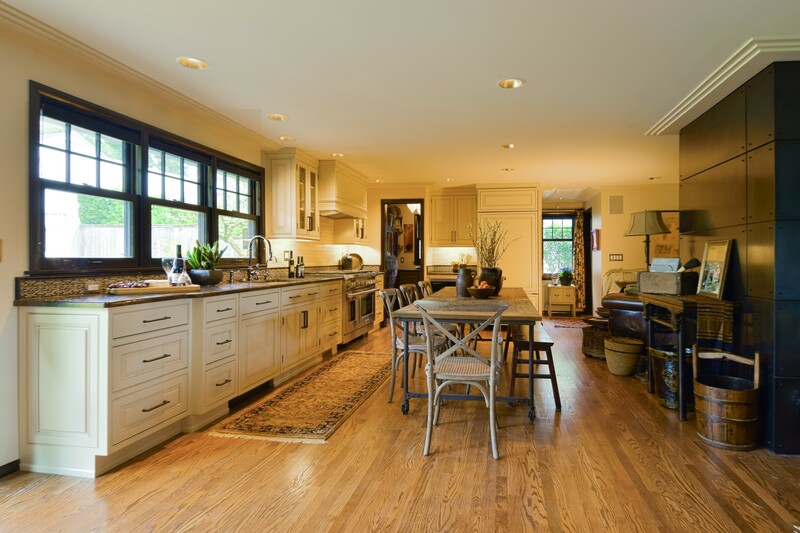 The end result is a beautiful space that turns the challenges of remodeling old buildings into advantages. 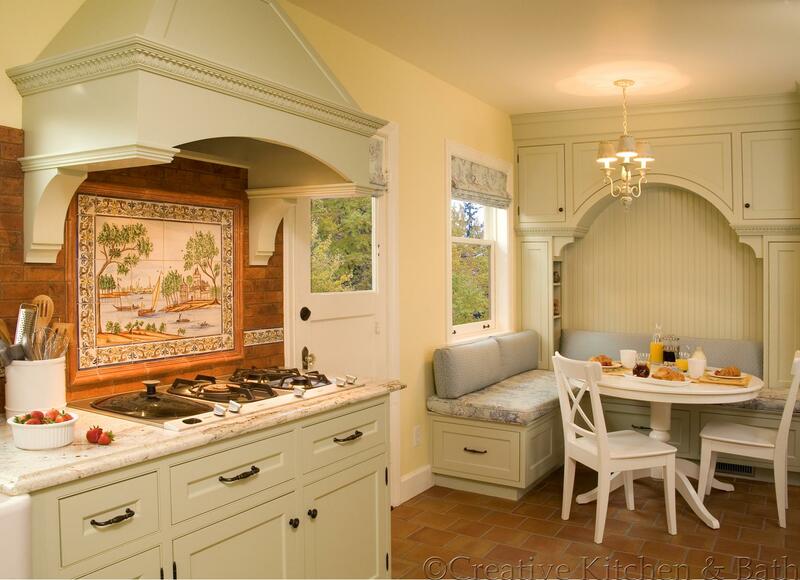 Re-imagined arrangement of this kitchen layout turned wasted space into functional space. 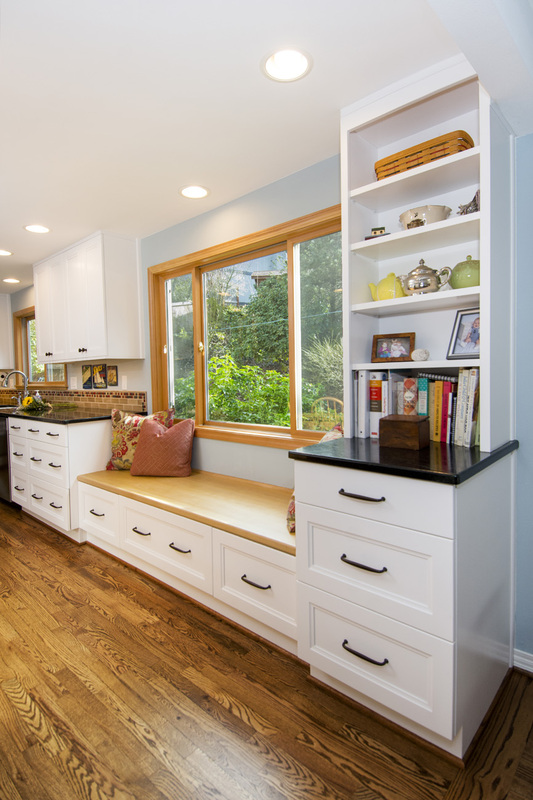 Built-in seating under the window, a small accent island, and full-height book shelves give this small kitchen big storage. 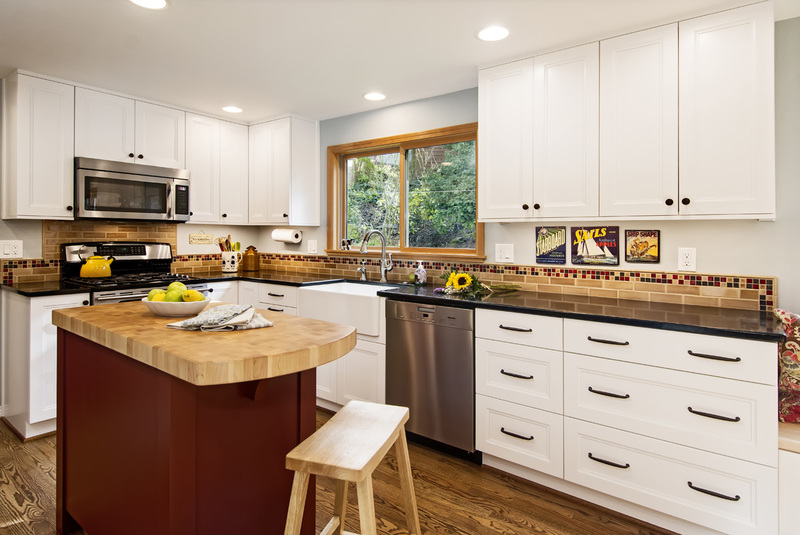 Soapstone and wood countertops, in combination with the warm color tones and intricate accents, give this kitchen a cozy and comfortable atmosphere. 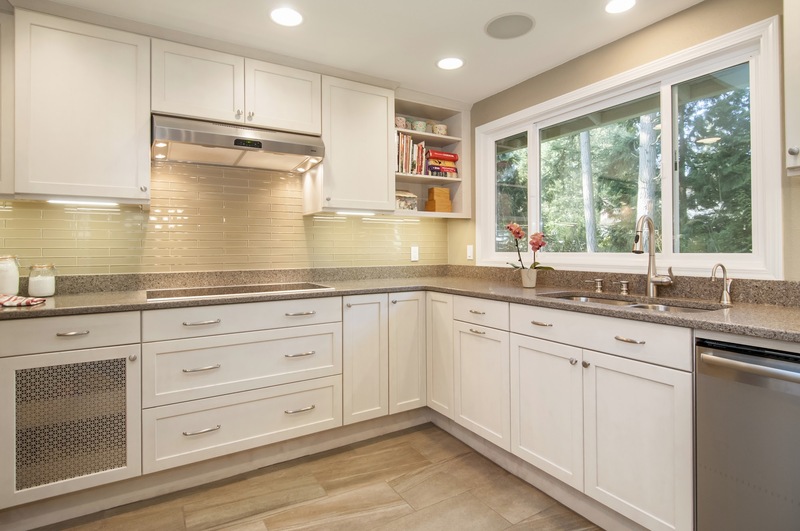 By bringing in a warm neutral color palette, this kitchen is transformed into a modern space with a classic feel - a perfect example of transitional design. 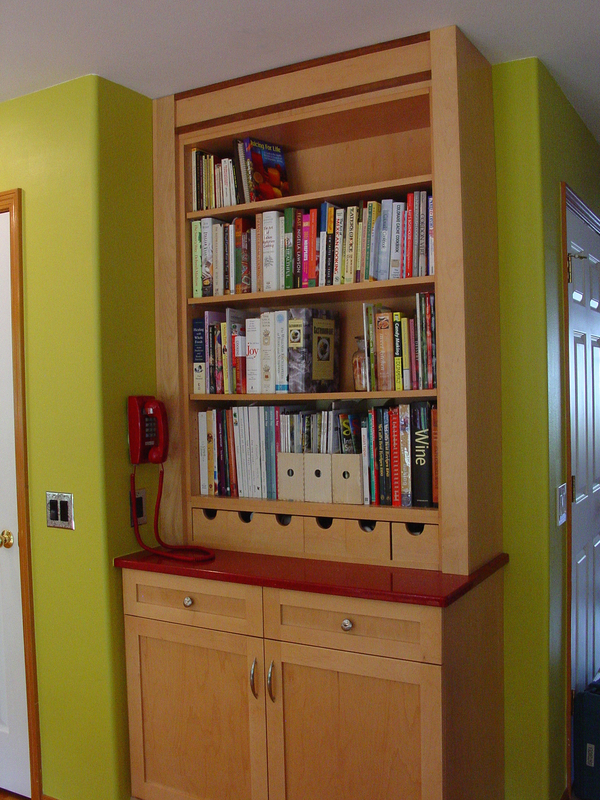 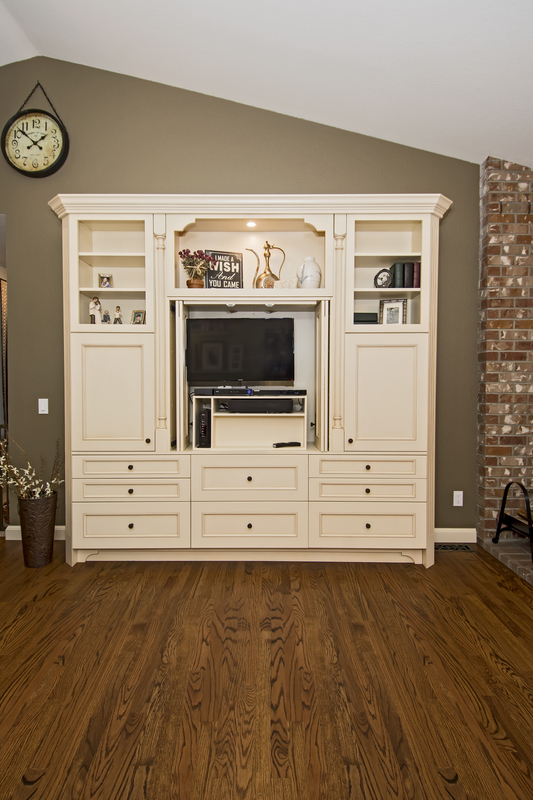 A custom cabinet hutch provides storage space specifically designed for the home owner's media devices and decorative accessories. 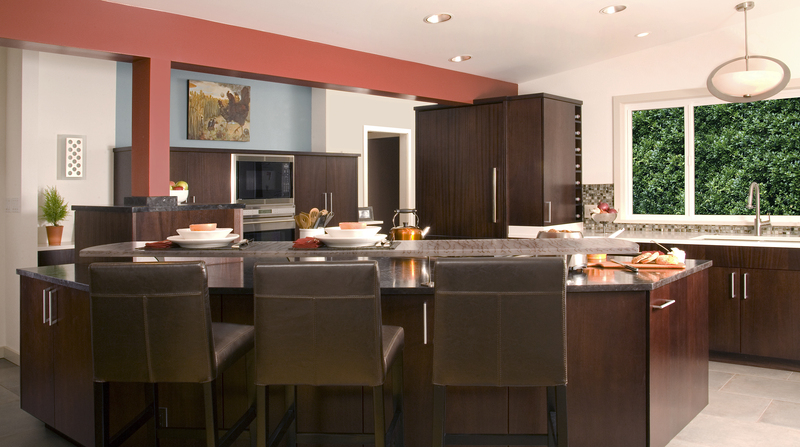 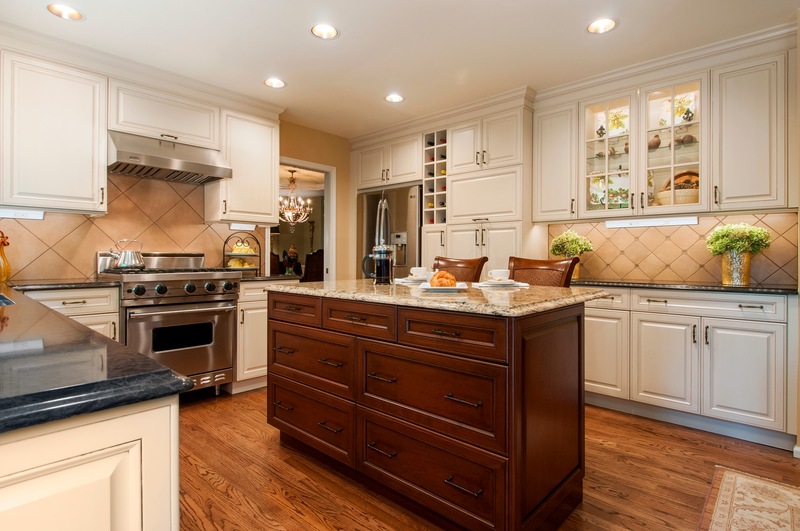 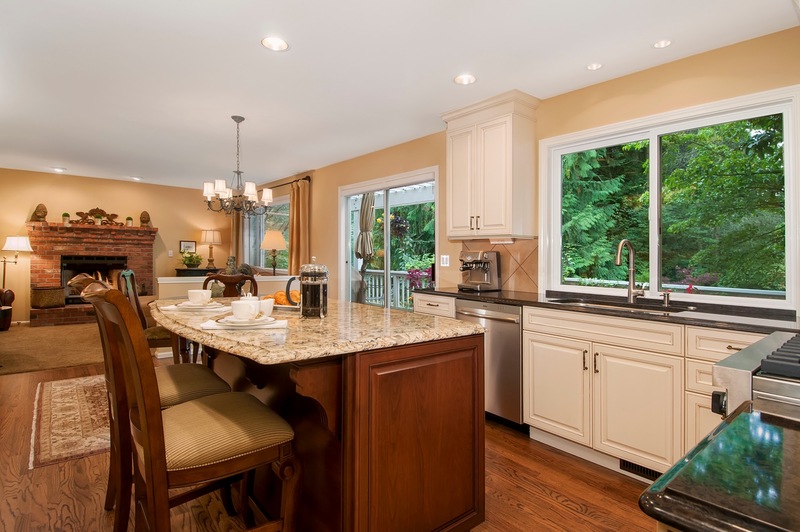 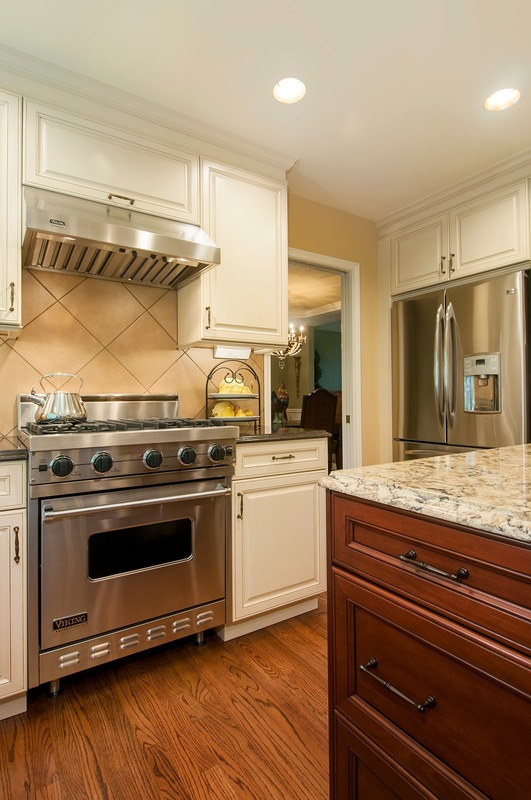 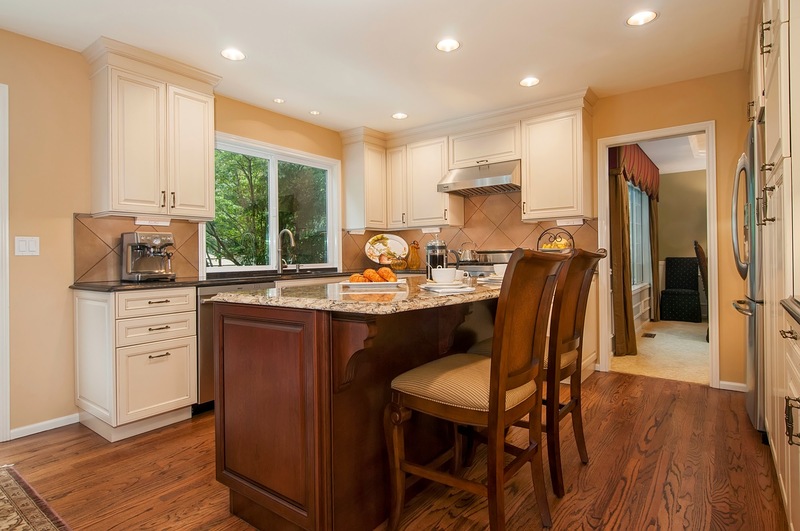 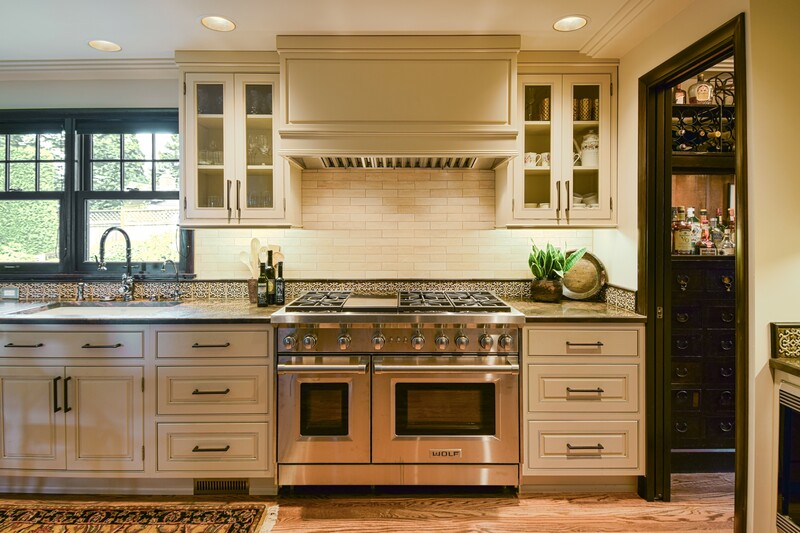 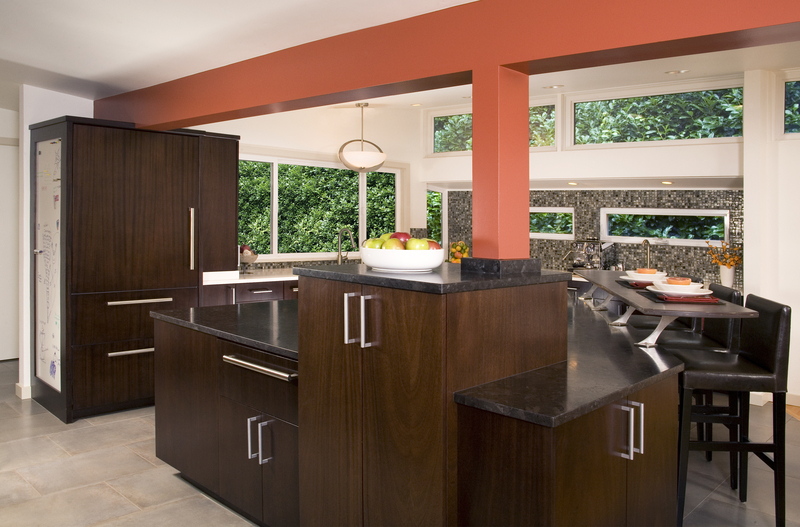 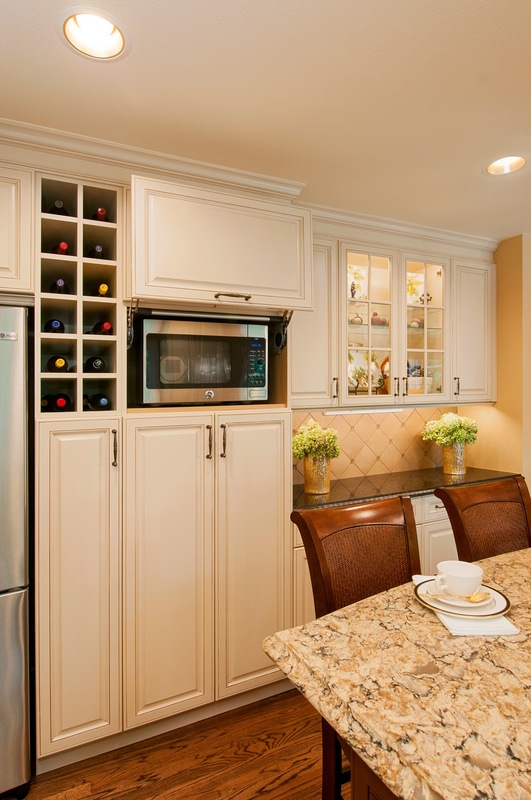 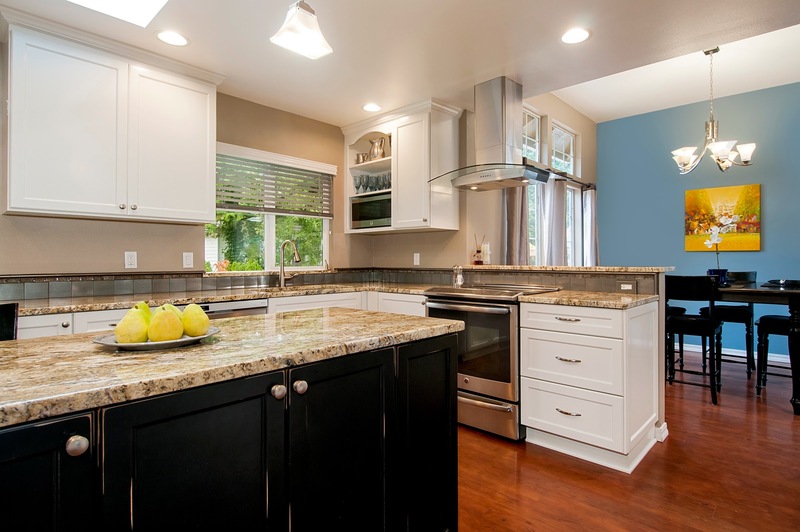 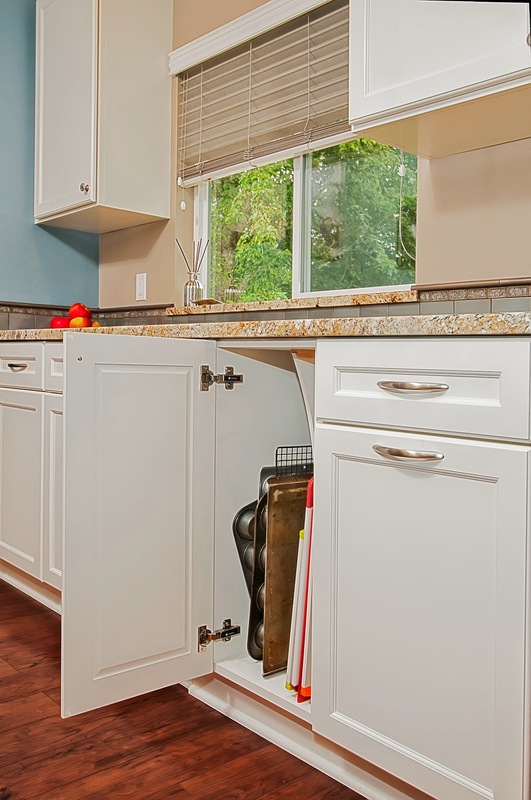 Painted cabinets with brown glazing underscore the transitional style of the kitchen. 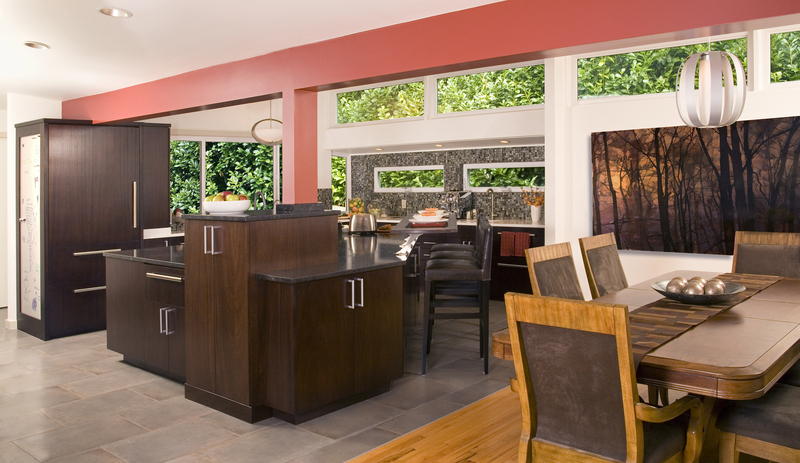 This kitchen was closed off from the rest of the living area, so walls were torn down to open it to the dining area. 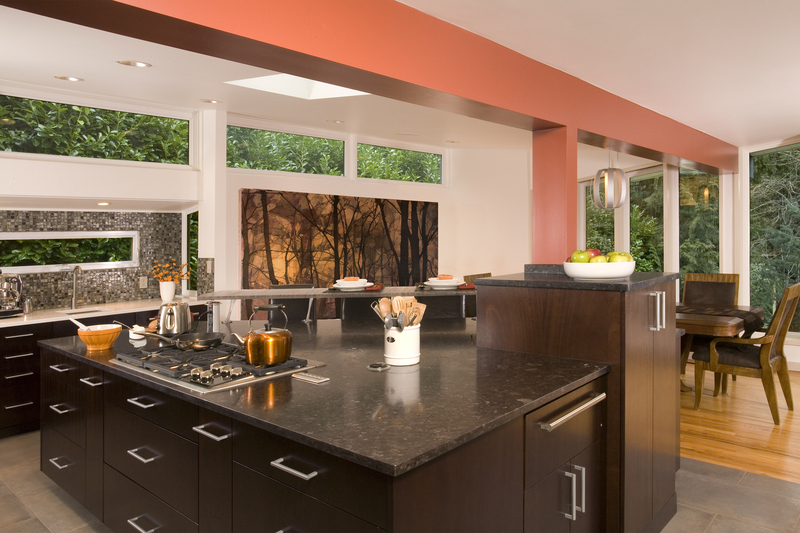 Now the kitchen serves as a focal point of the home. 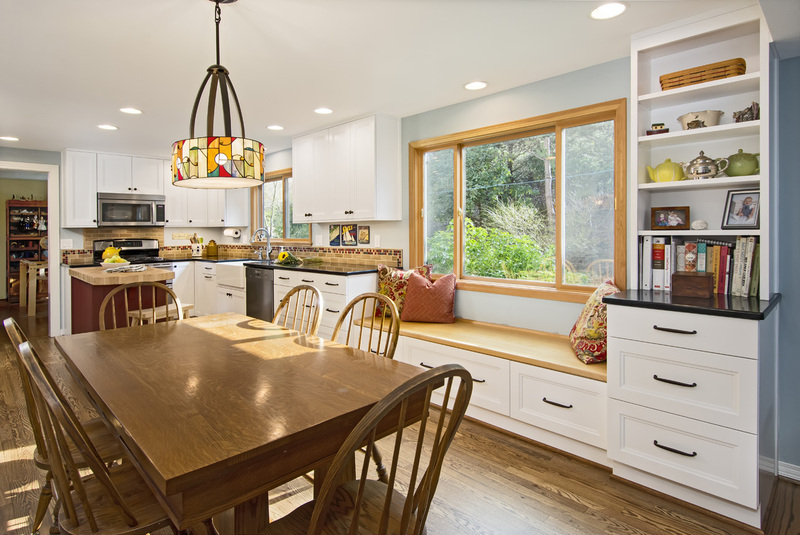 Natural light, open spaces, and soft colors are the character and beauty of this kitchen. 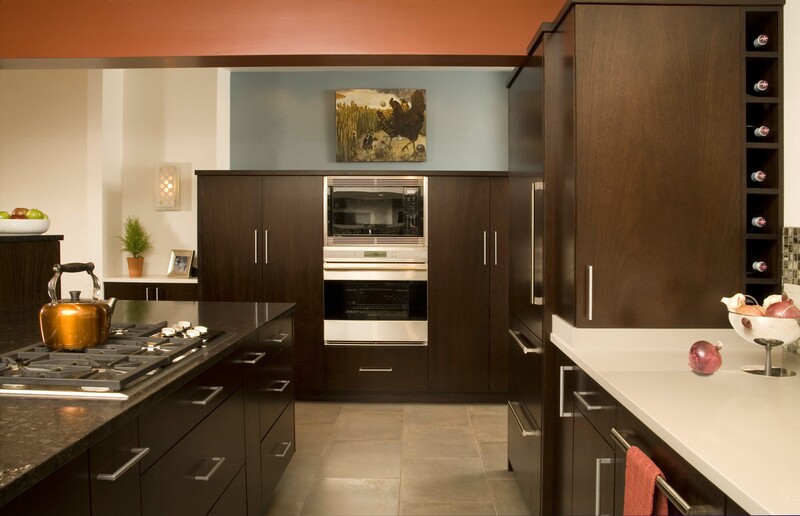 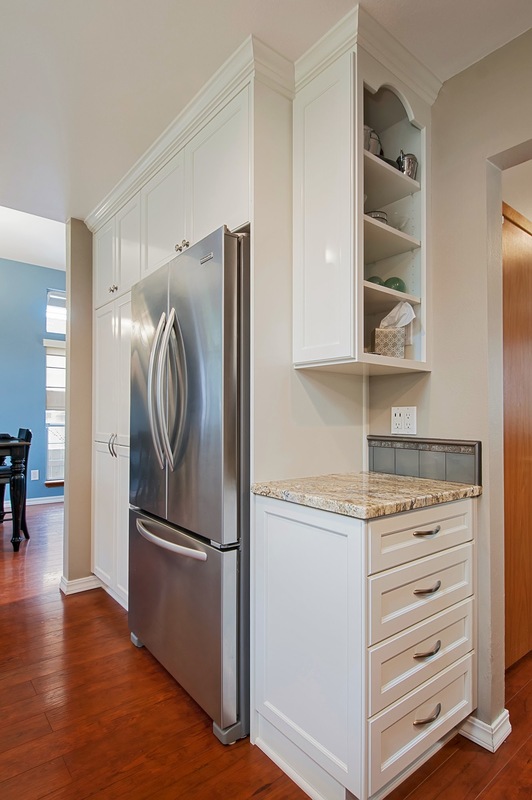 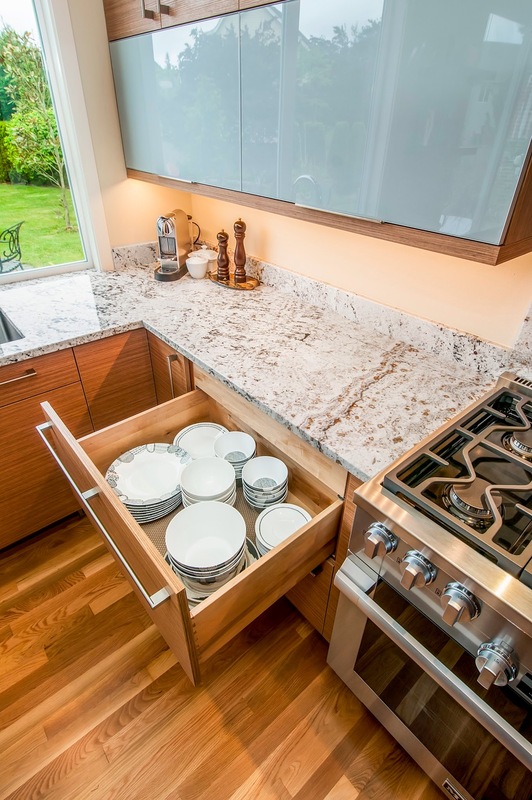 Clean lines, a bright palette, and specialty cabinets are features of the design. 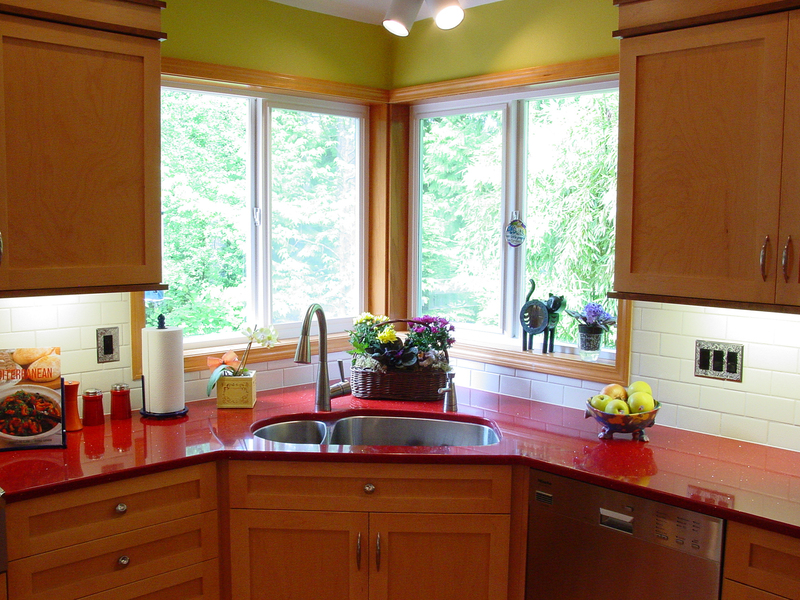 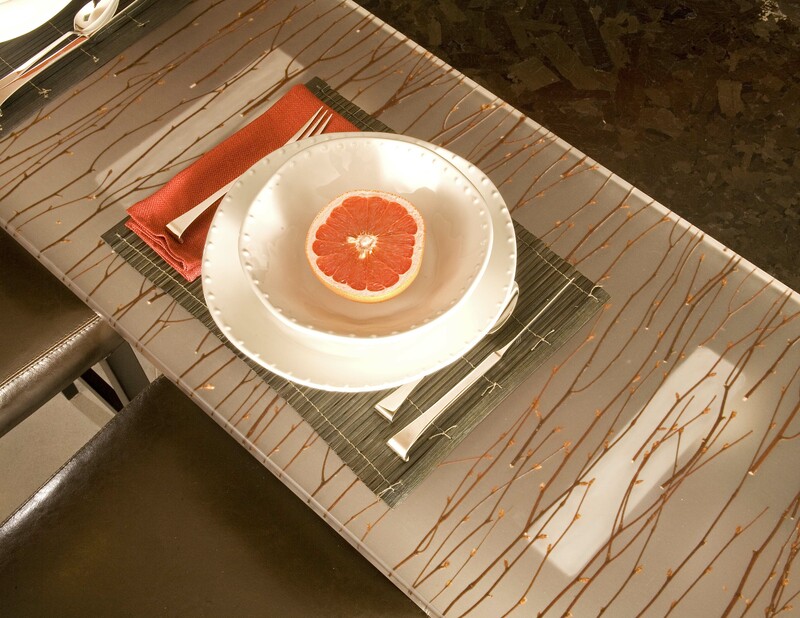 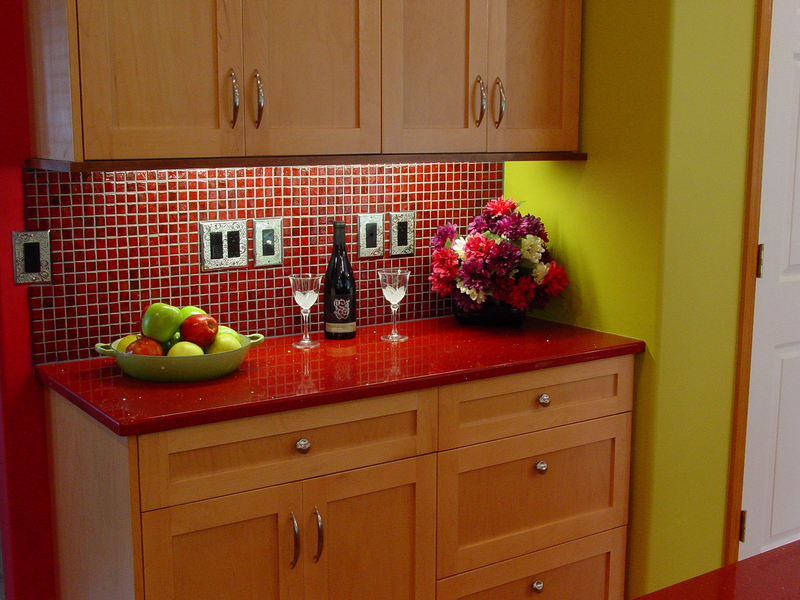 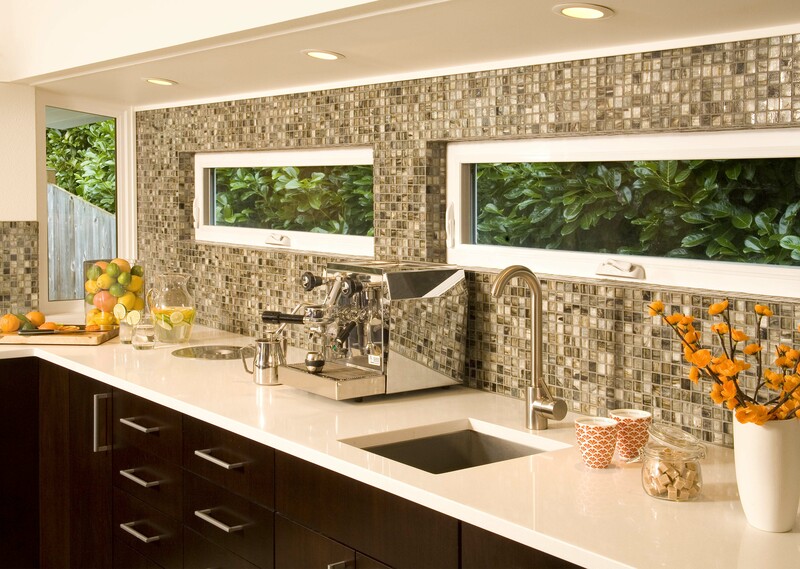 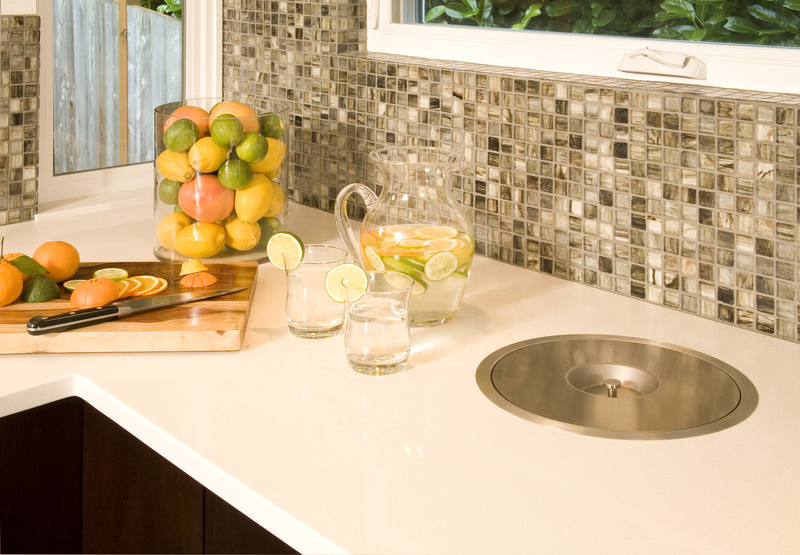 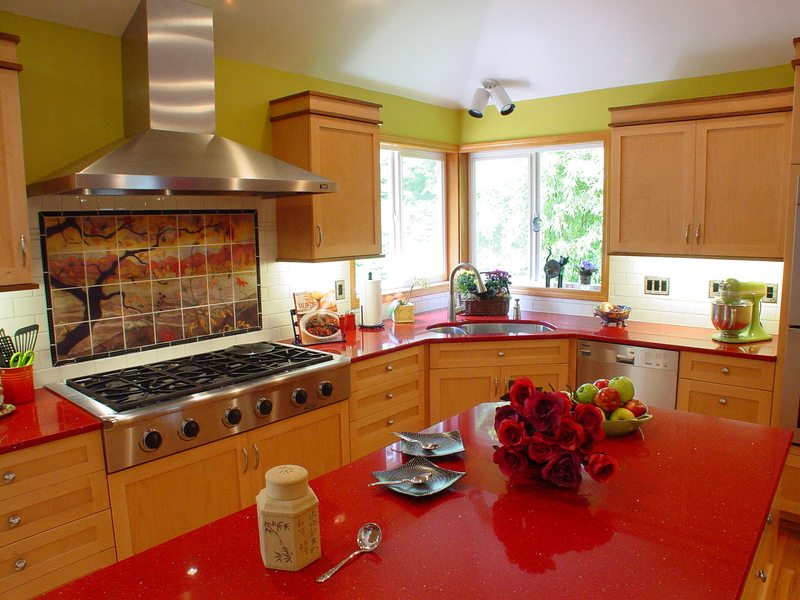 Glass backsplash tile and polished quartz countertops reflect light to add even more brightness to this kitchen. 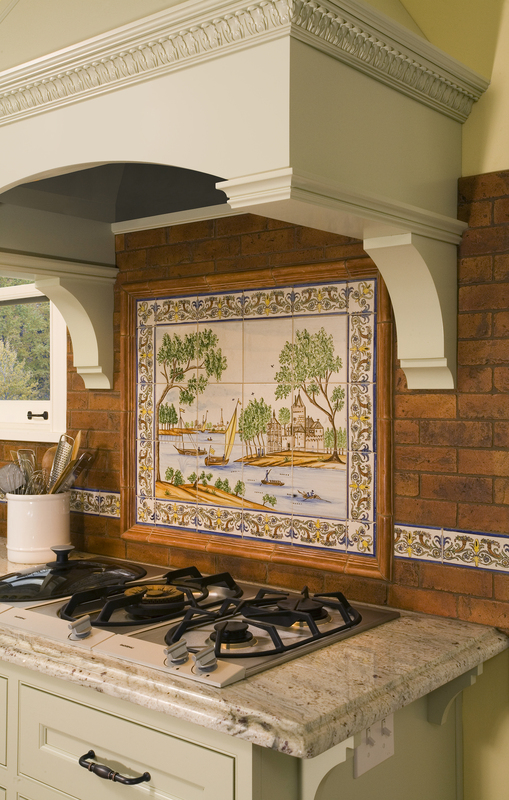 It's all about the decorative accents and fine details. 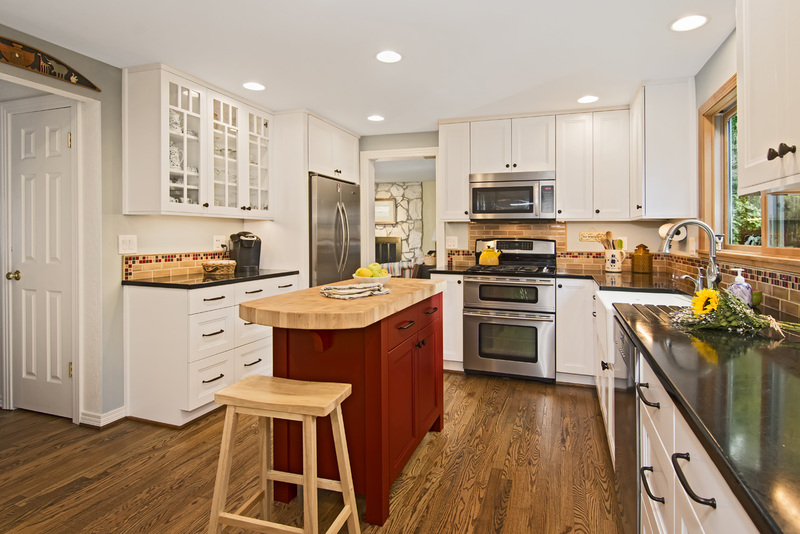 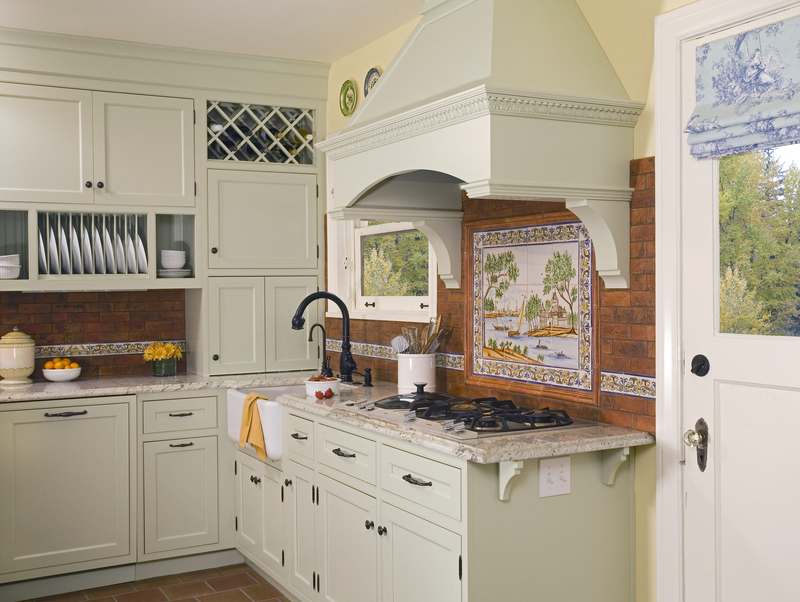 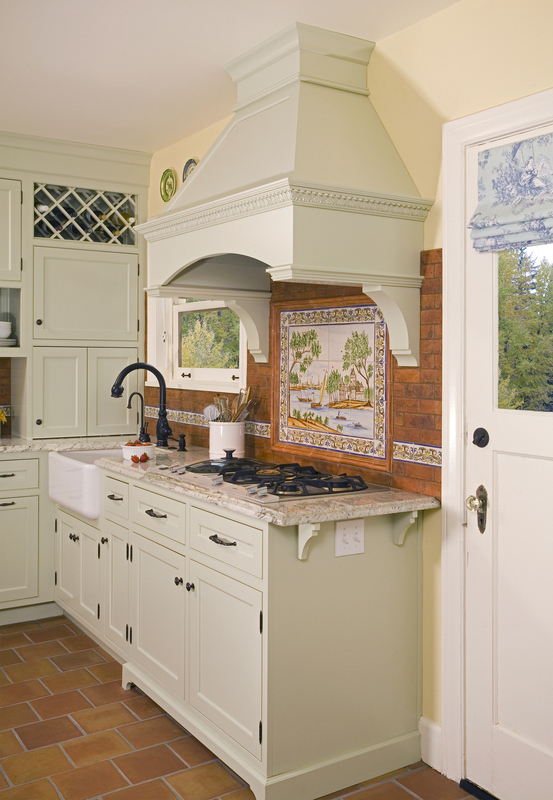 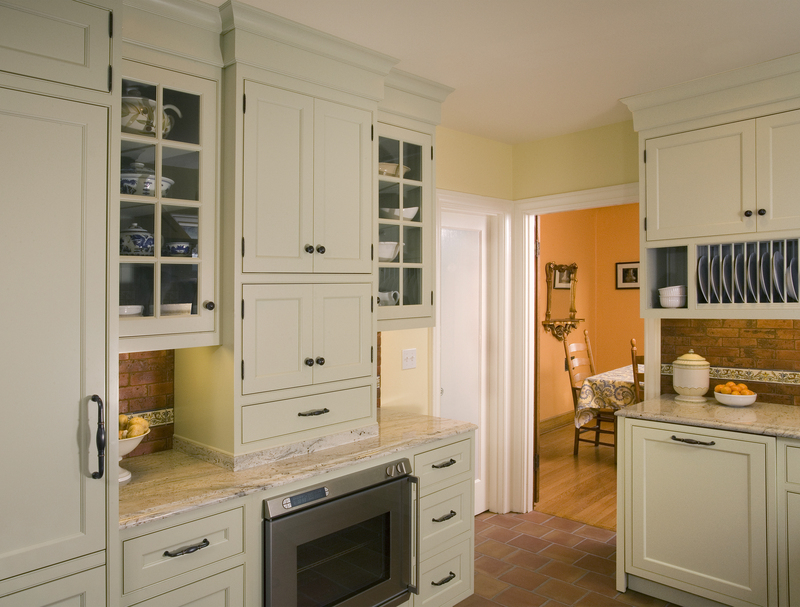 This kitchen combines painted and stained cabinets with fine molding details to bring traditional flavor to the space. 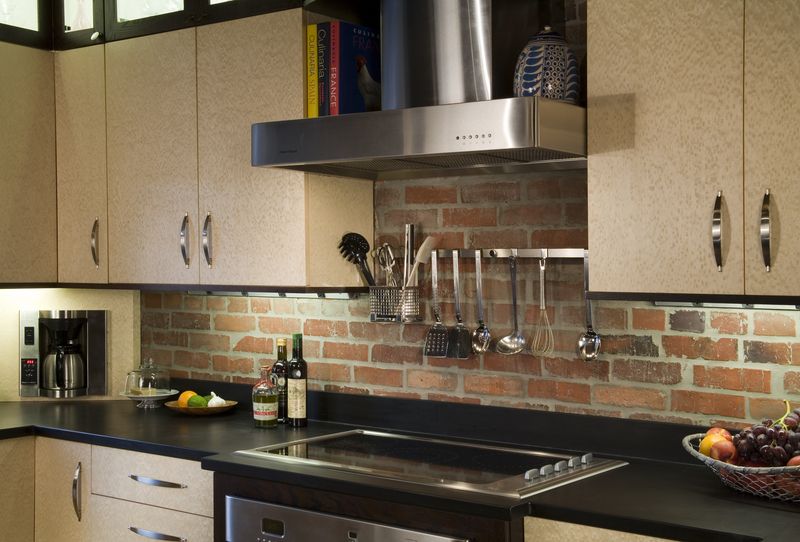 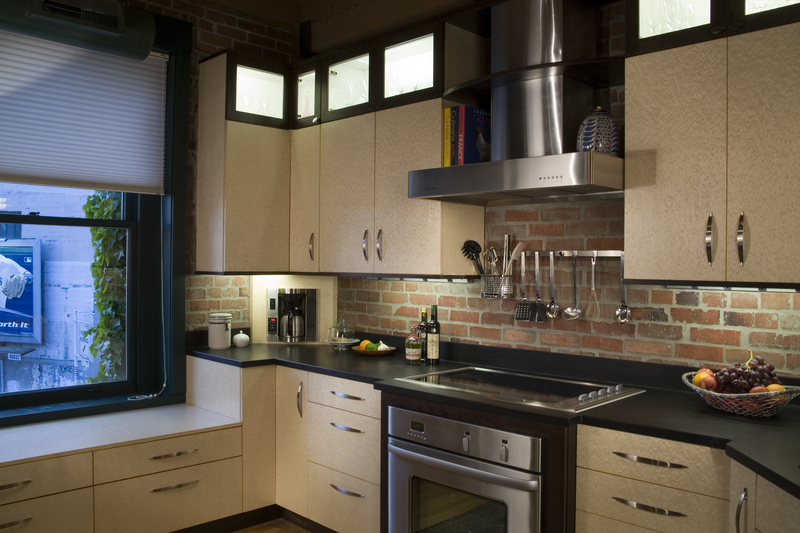 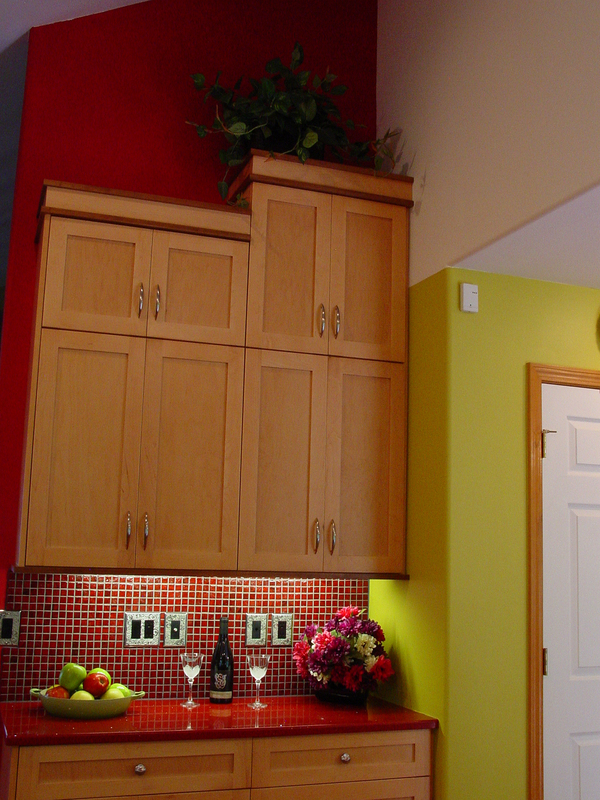 Updating the lighting plan with layers of ambient, task, and accent lights modernizes the kitchen. 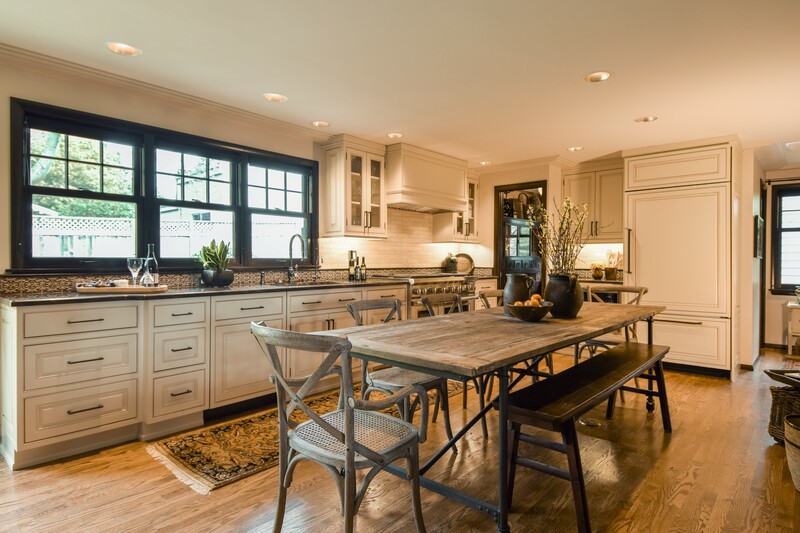 The combination of traditional touches and upgraded lighting create a beautiful kitchen that is true to the style of the home. 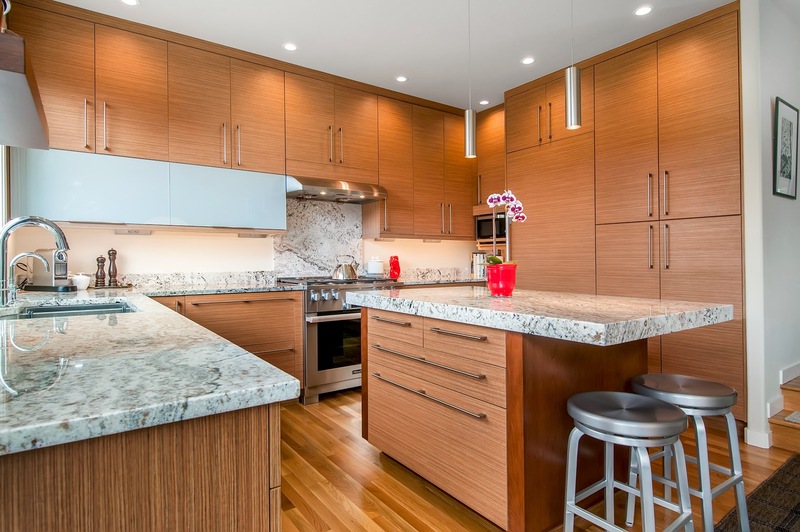 This luxury Seattle kitchen has a post-modern flare. 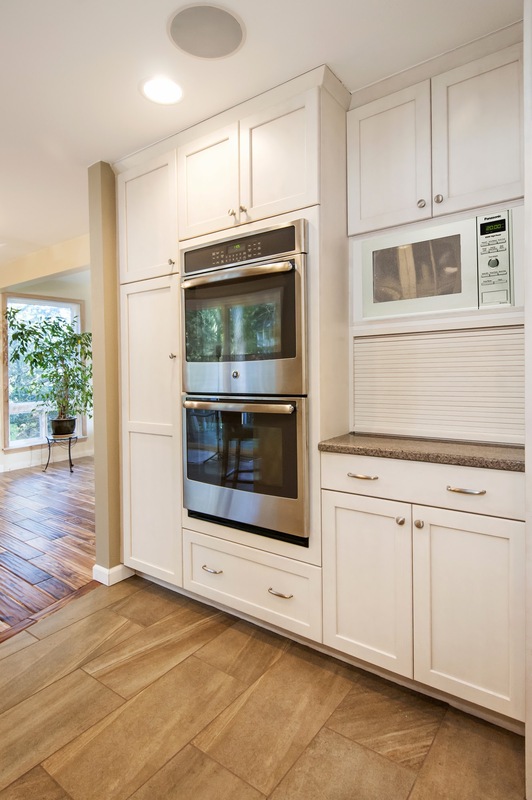 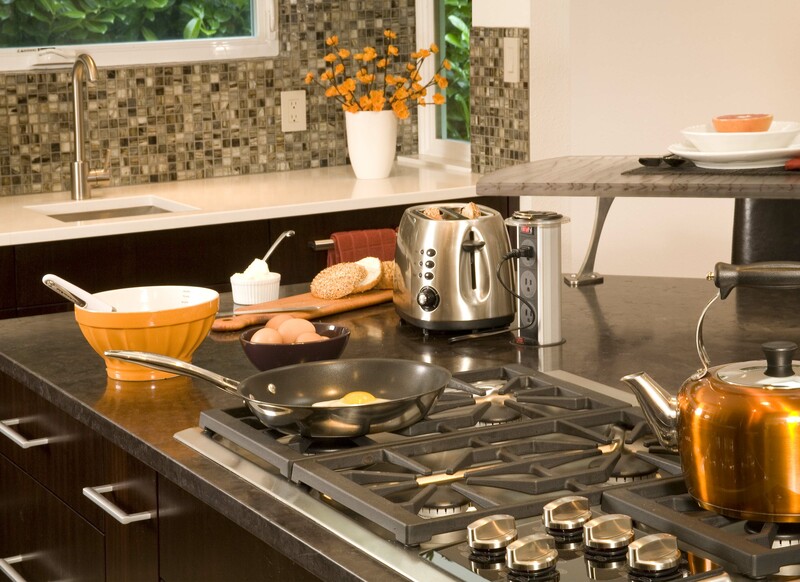 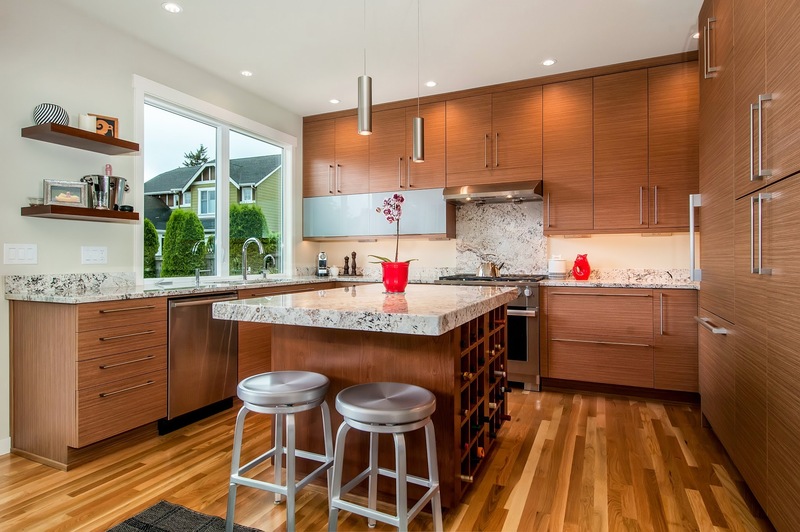 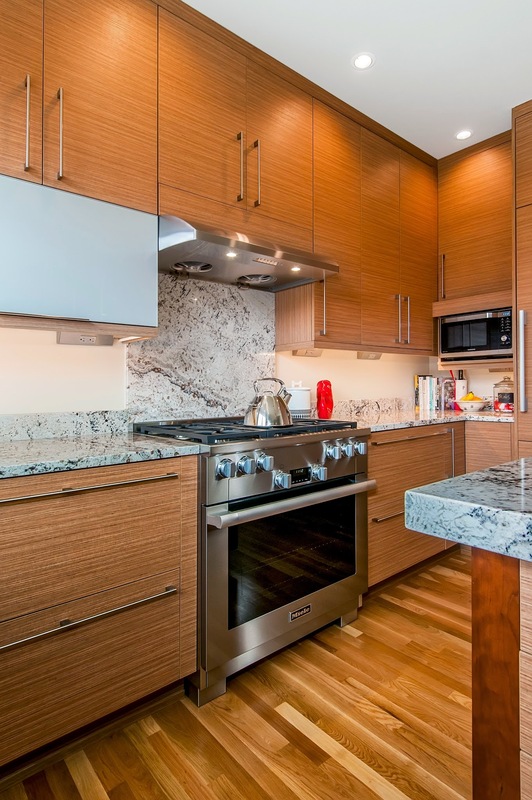 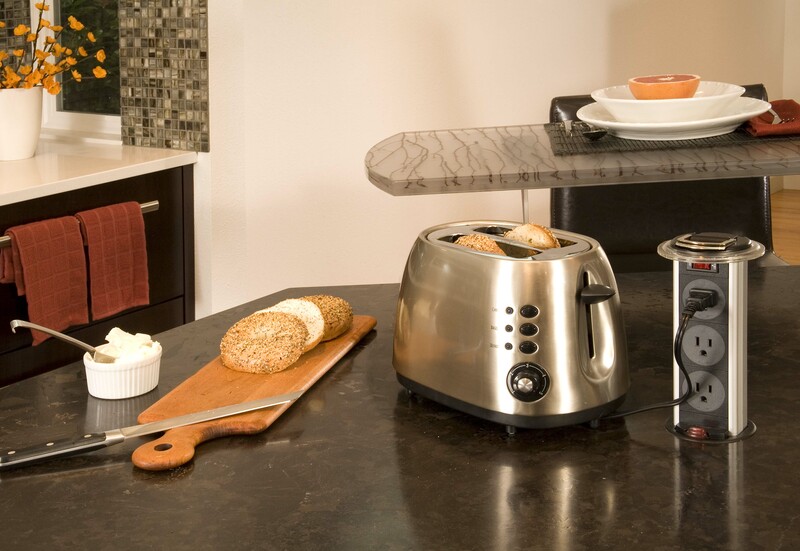 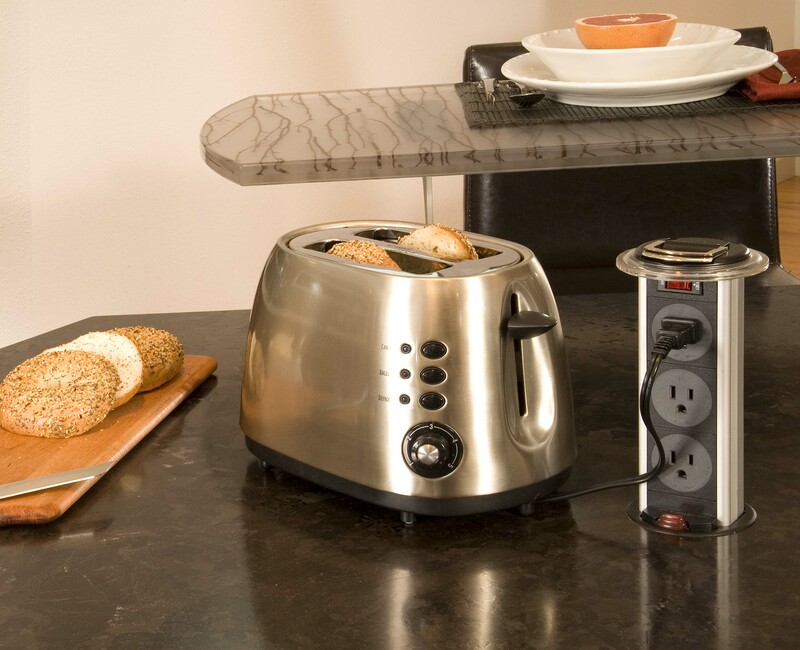 Lumicor bar top, glass accent backsplashes, and modern appliances are features of this spectacular space. 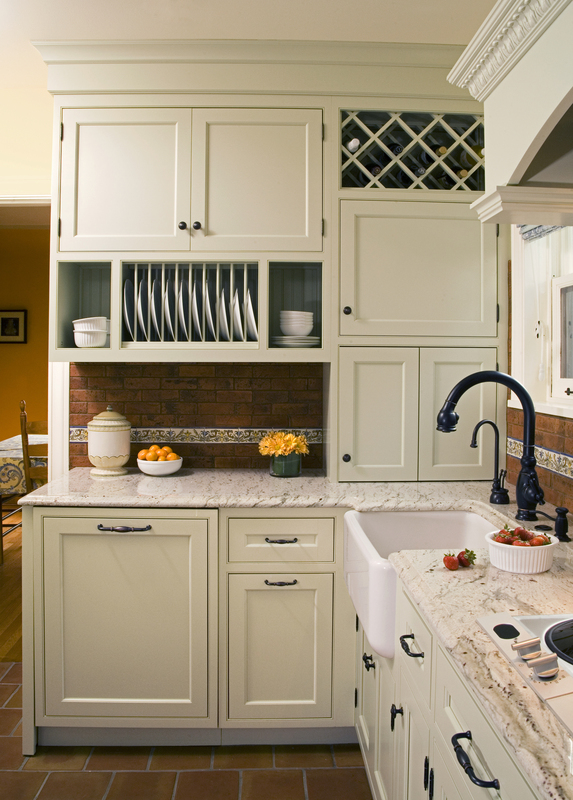 This award winning kitchen is all about the details. 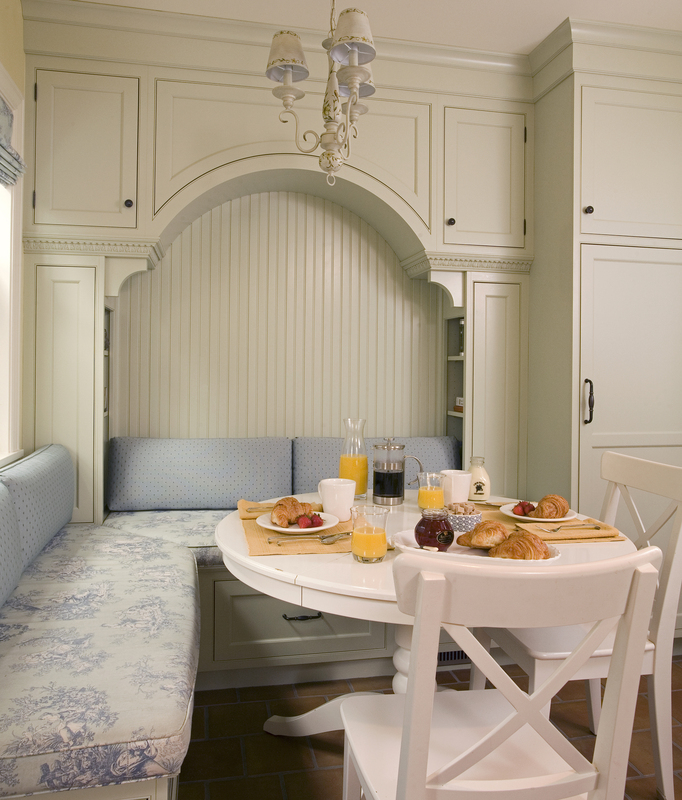 The built-in breakfast nook is the feature of the space. 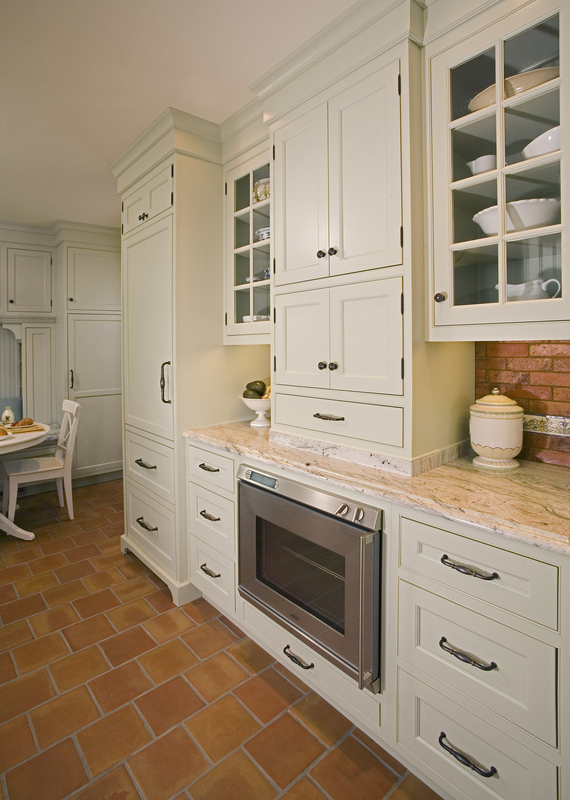 Custom cabinets by Crystal Cabinetry in a light sage green complement the warm red brick tones in this traditional home. 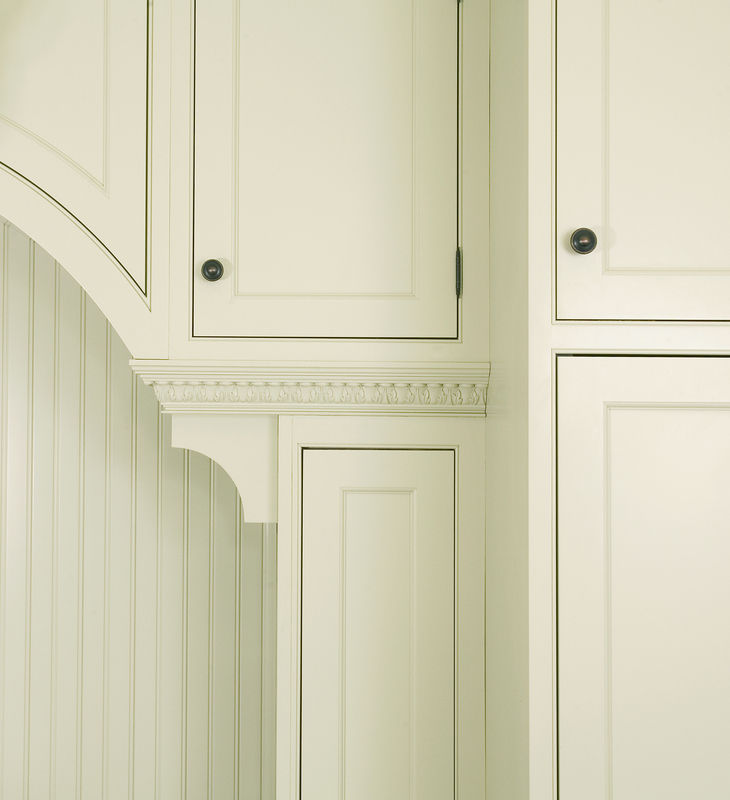 In-set cabinet doors with exposed hinges and intricate molding details are the elegant finishing touches. 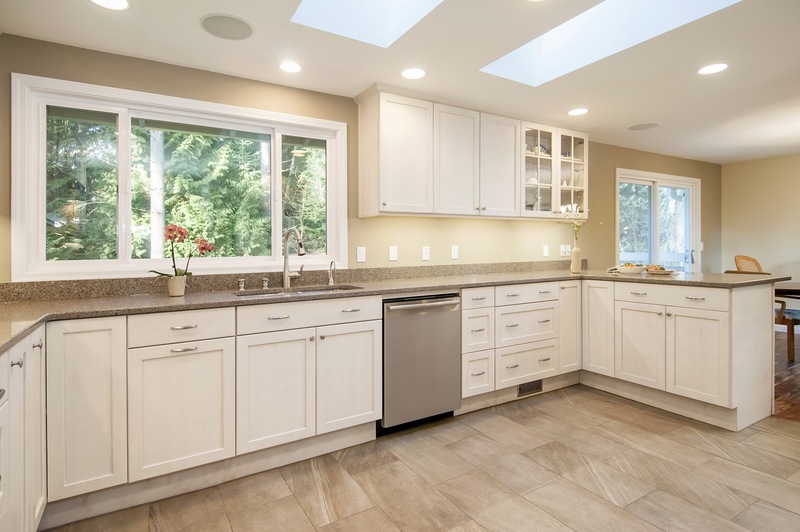 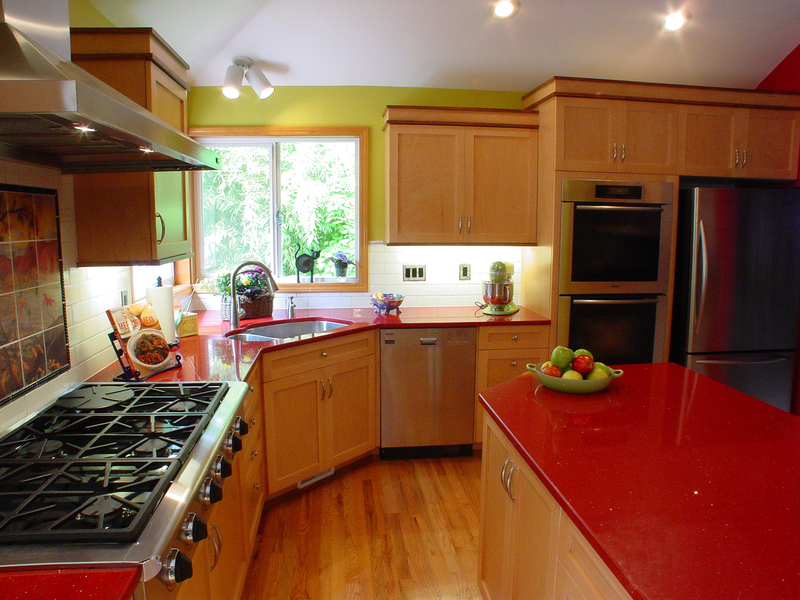 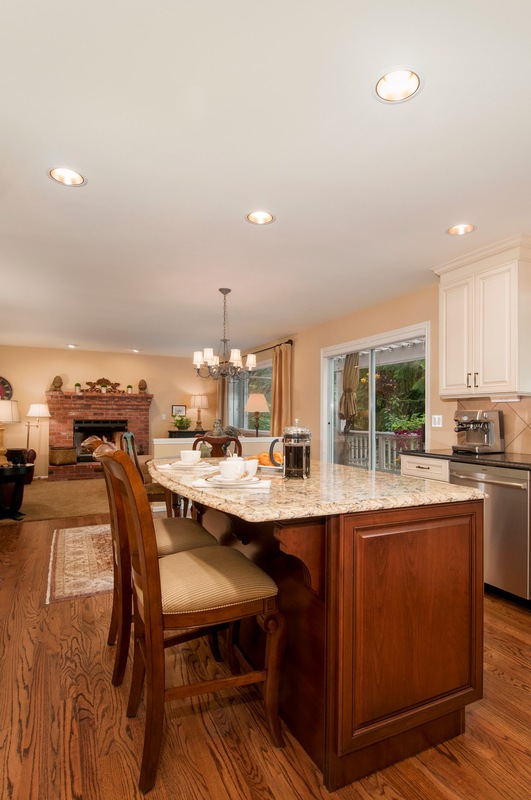 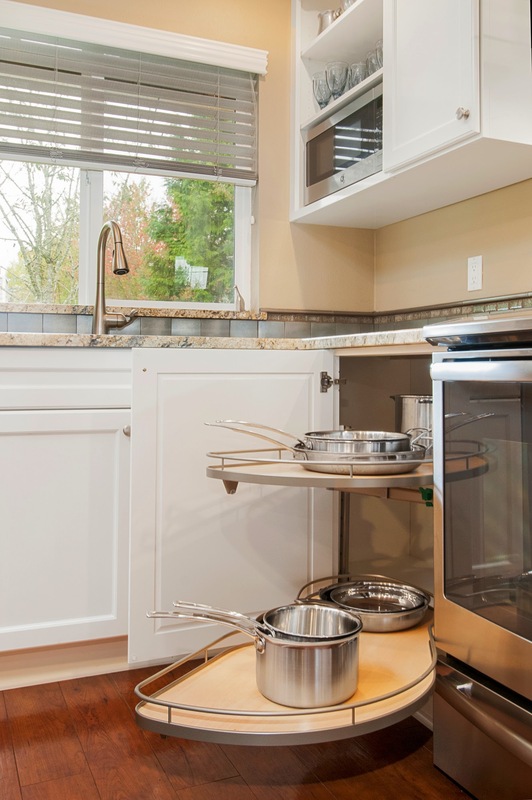 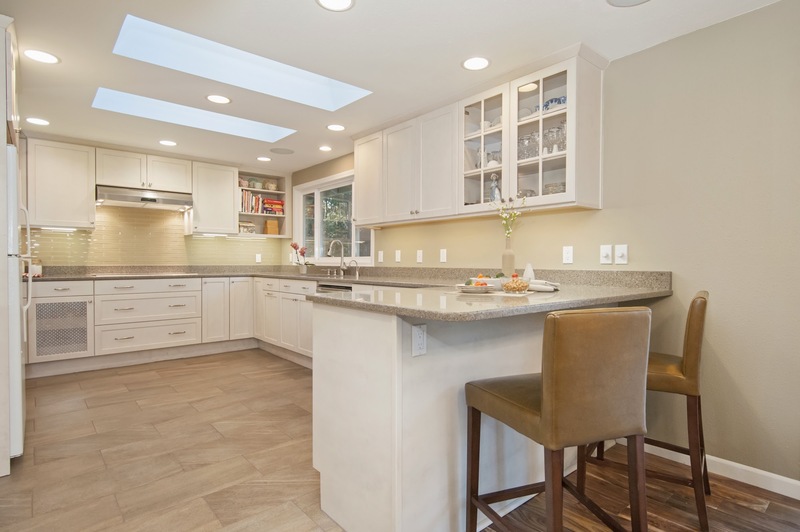 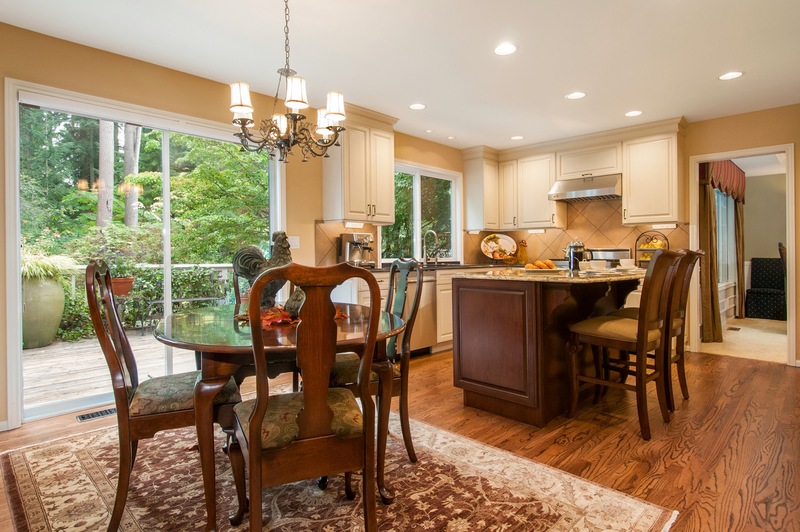 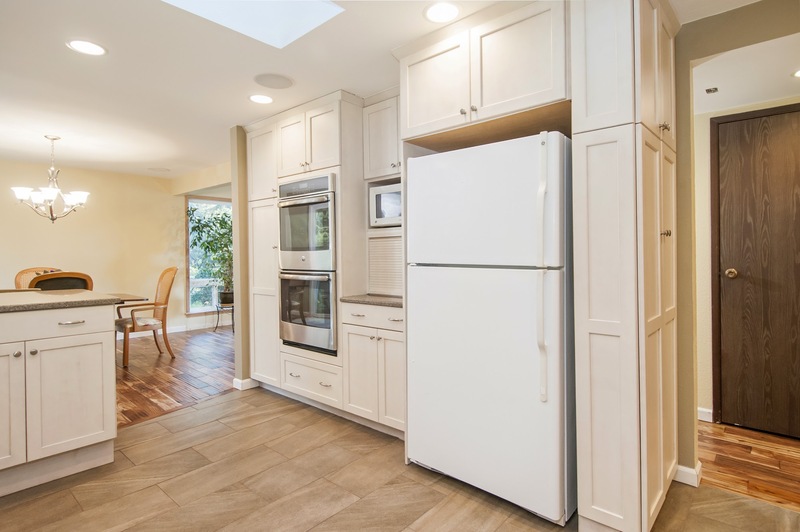 This Bellevue kitchen almost doubled in size when the wall between the kitchen and dining room was torn down. 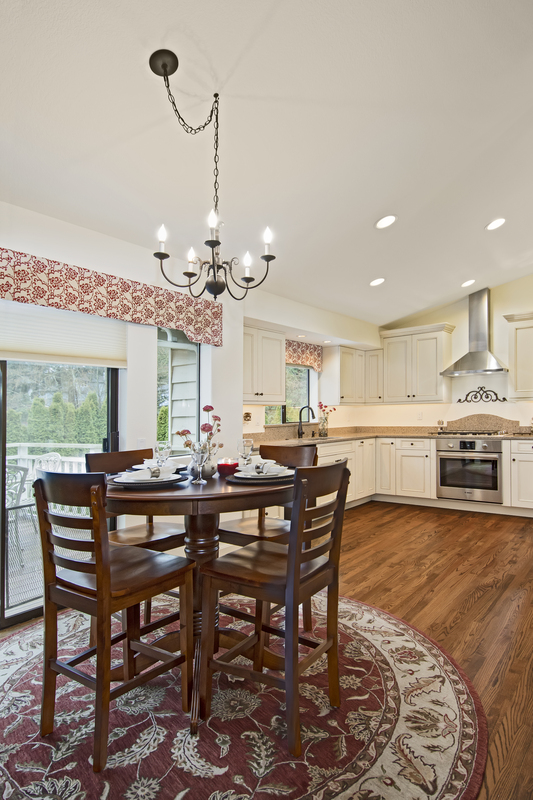 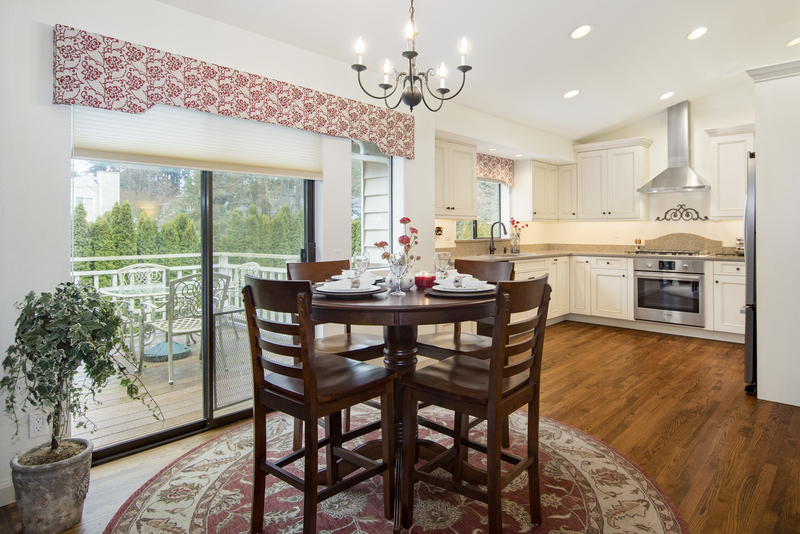 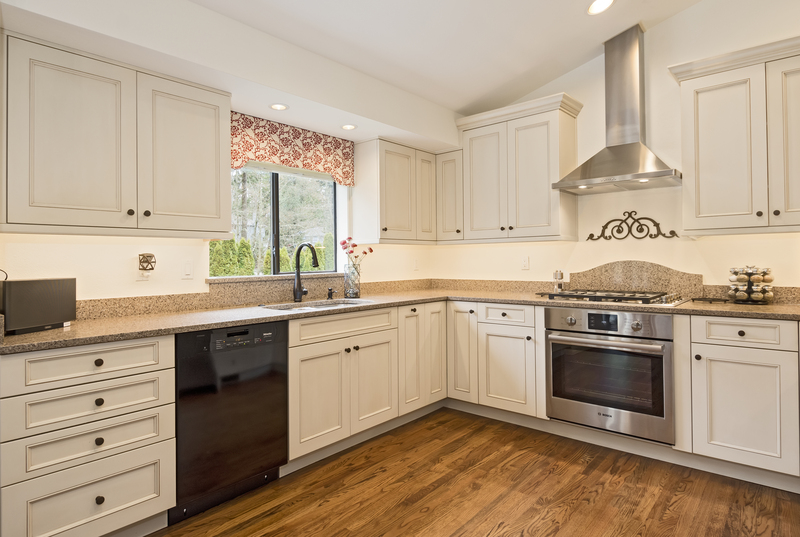 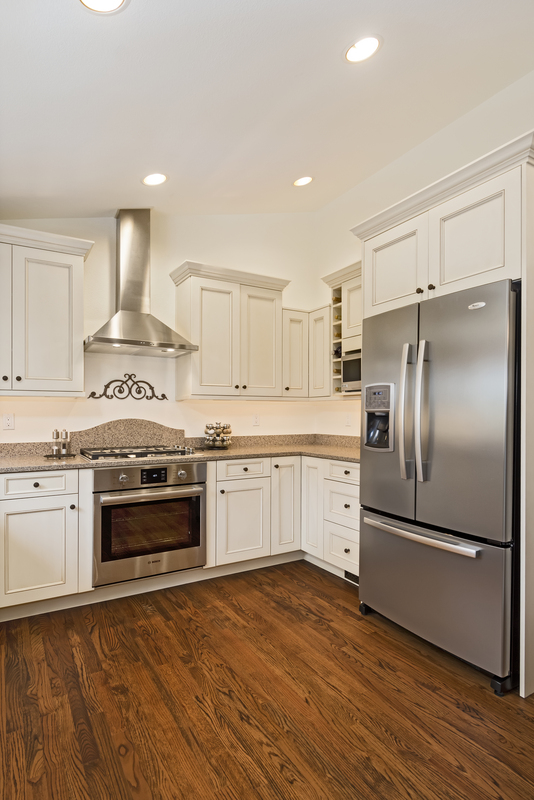 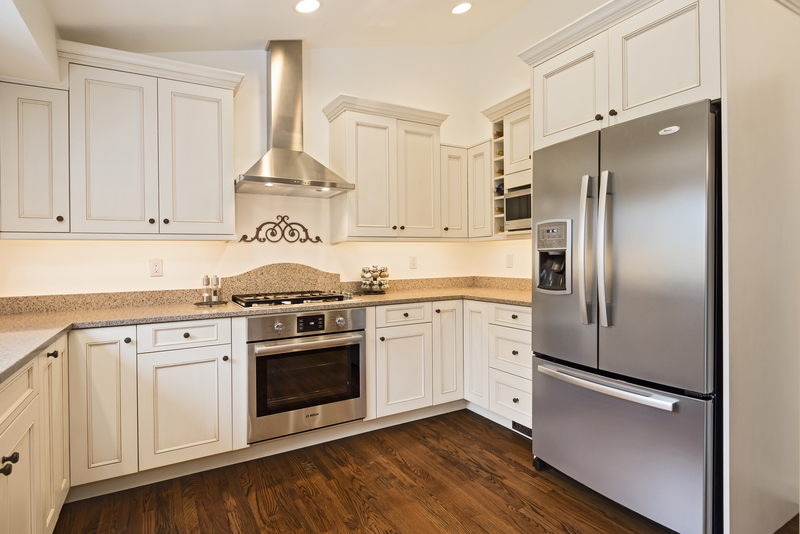 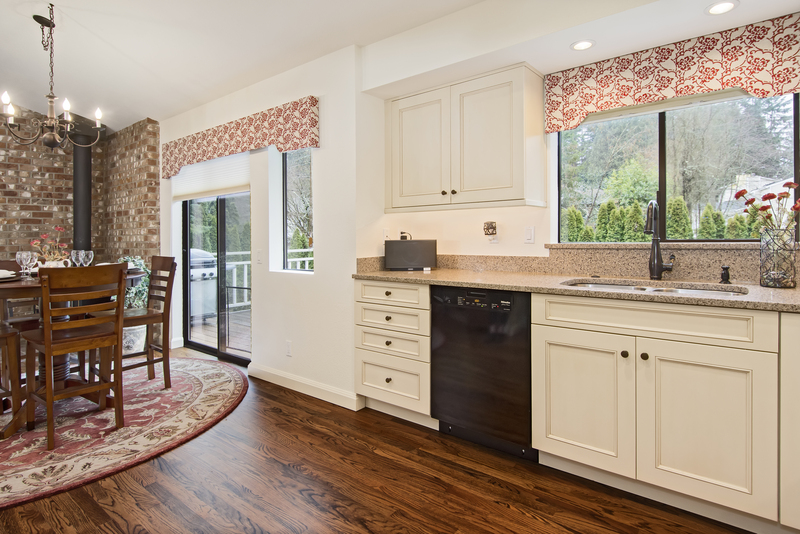 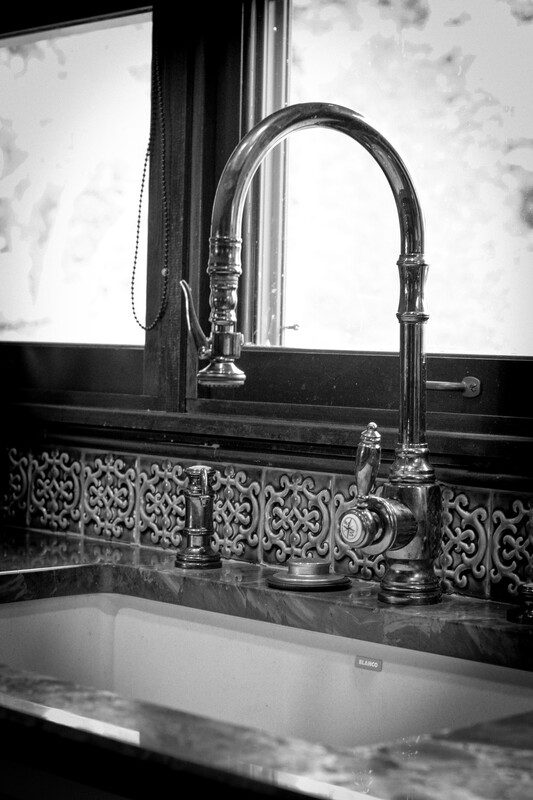 In keeping with the style of the home, the new kitchen is traditional and chic. 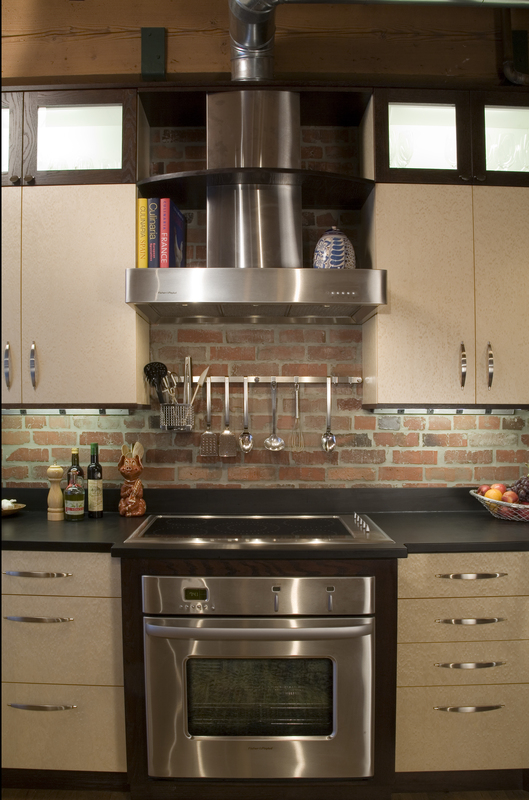 The pull-down faucet from Waterstone Faucets and the Copper Dune granite countertops add to the richness of the design palette. 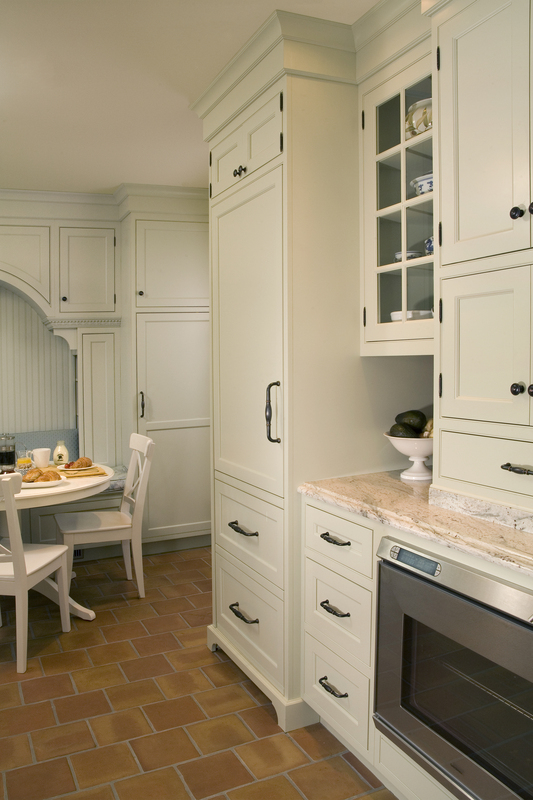 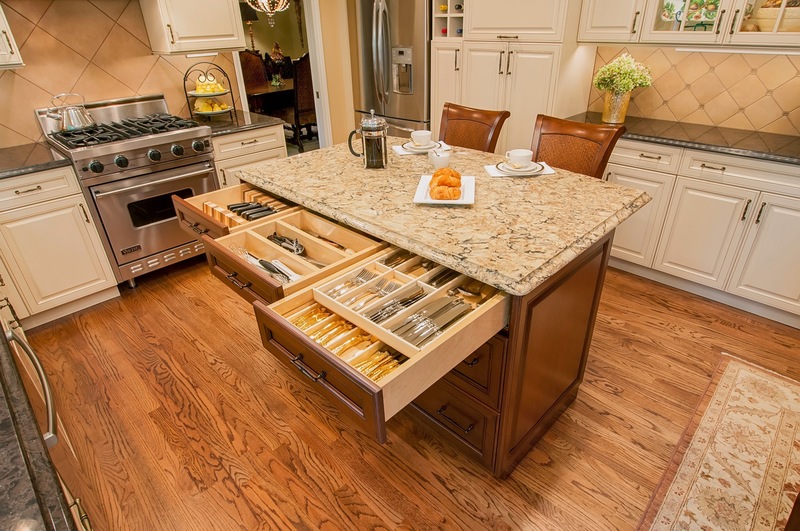 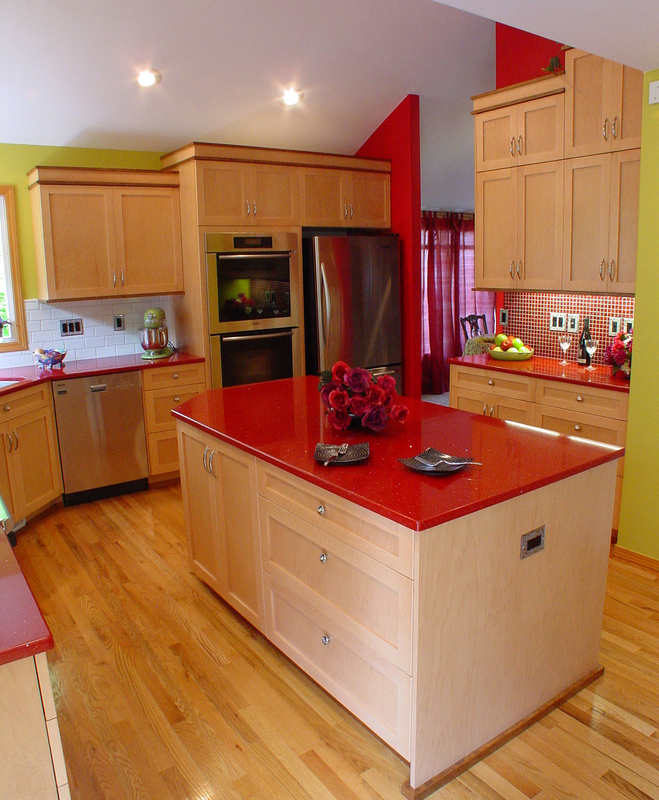 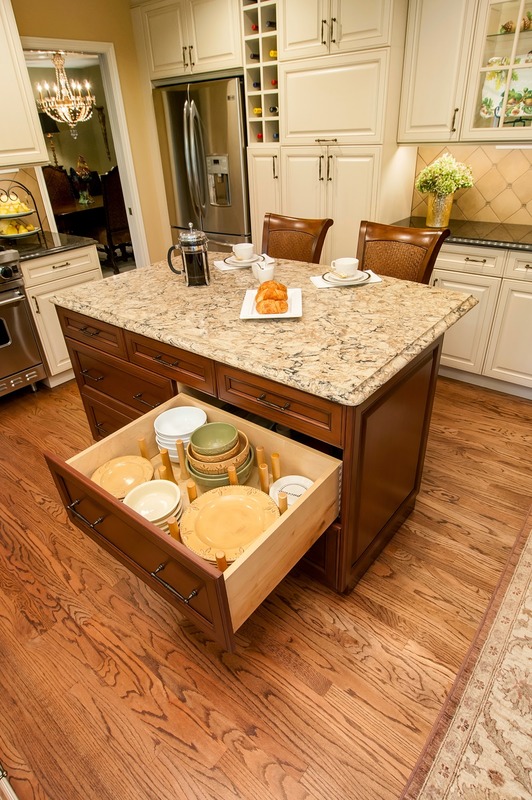 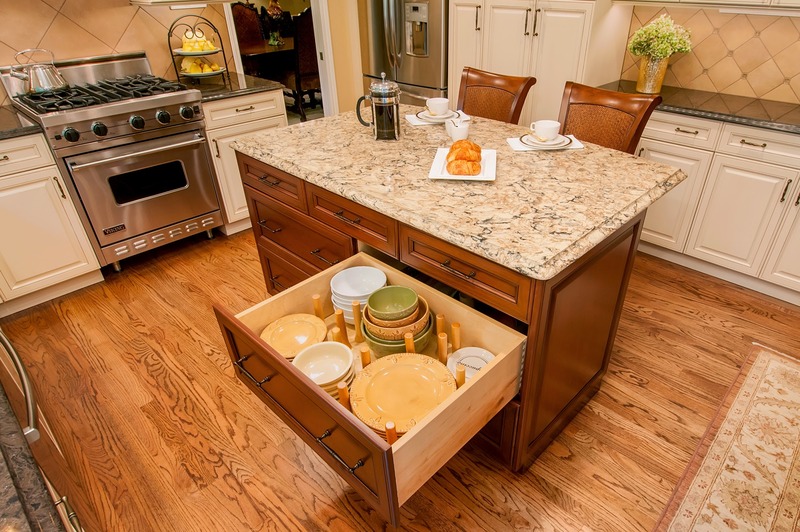 Custom cabinets are by Bellmont Cabinetry. 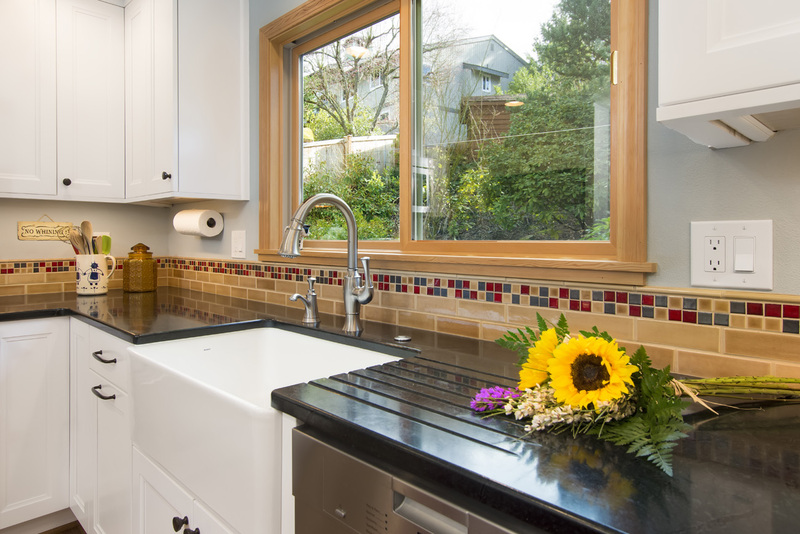 Check out our Bathrooms portfolio for images of the laundry room, bathroom, and dog-wash in this home. 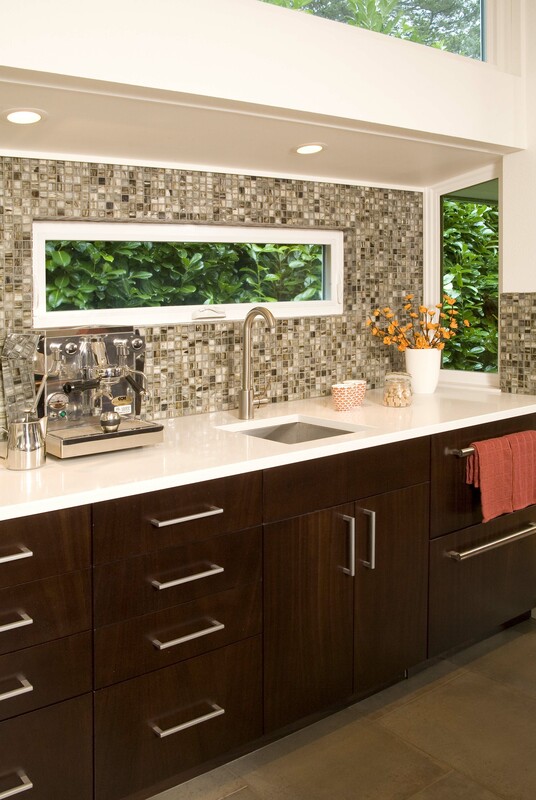 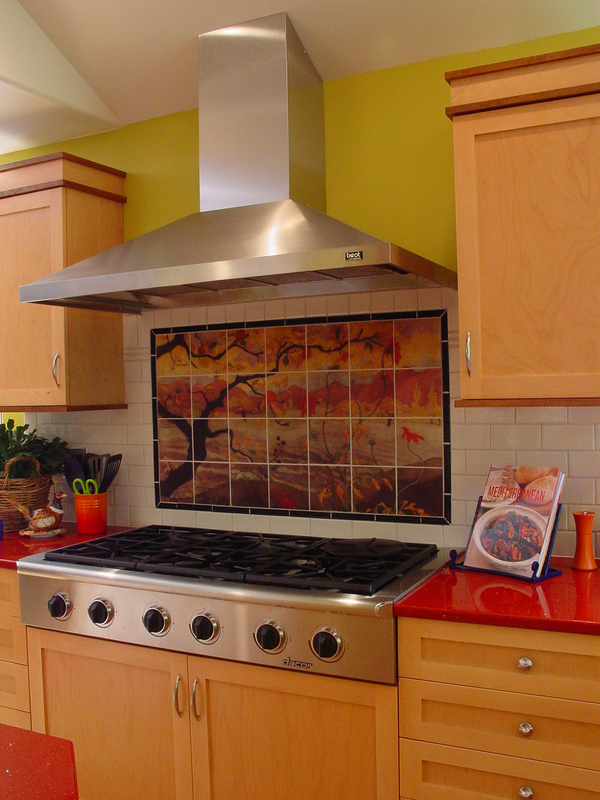 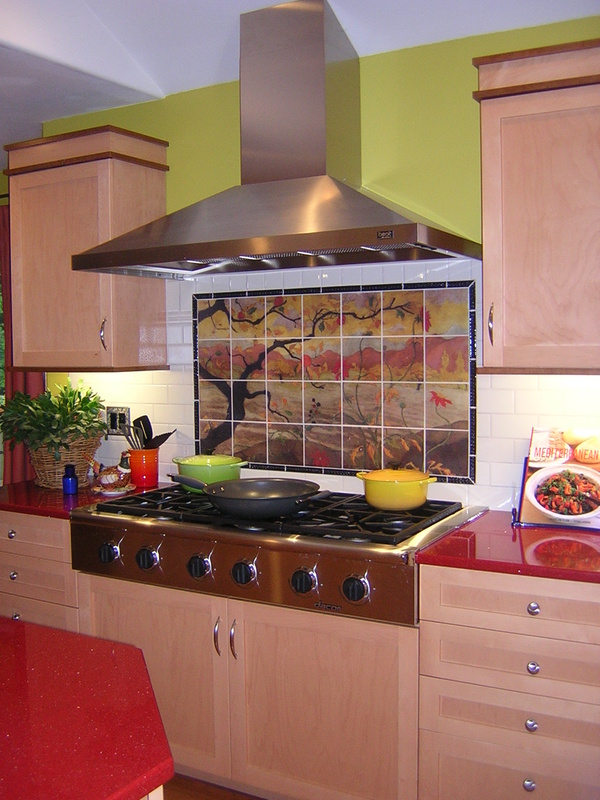 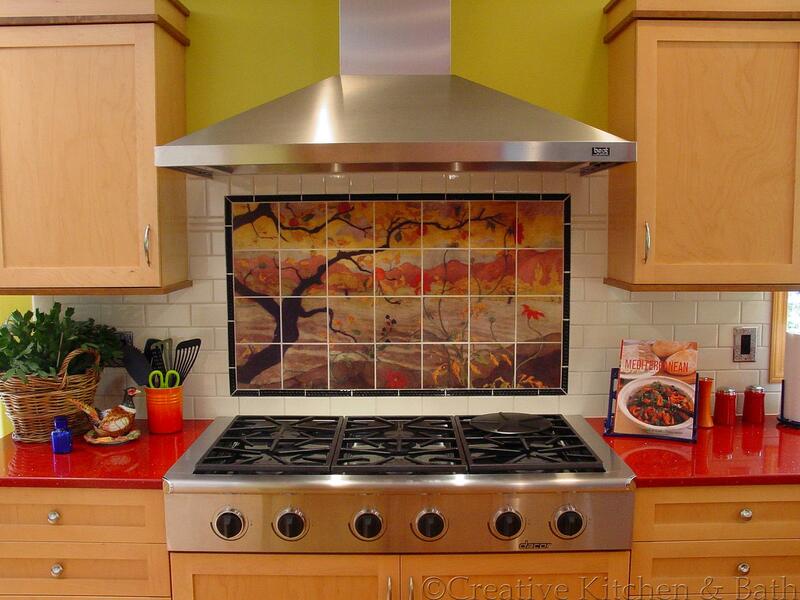 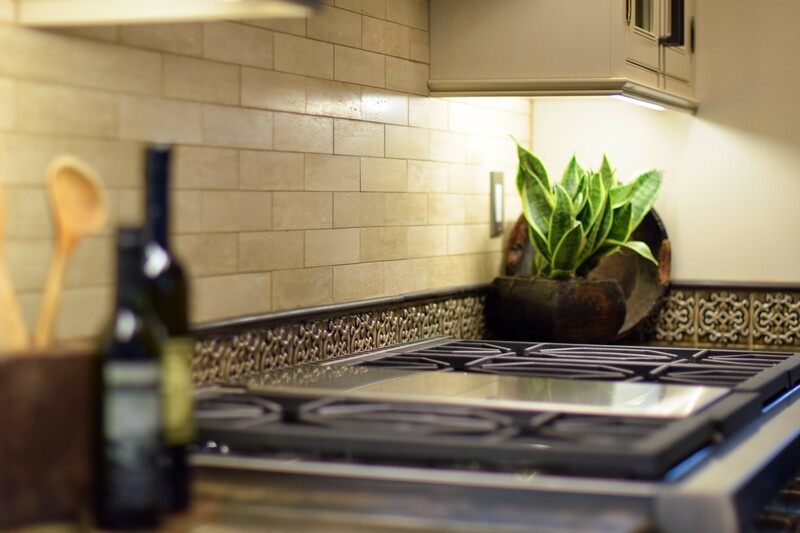 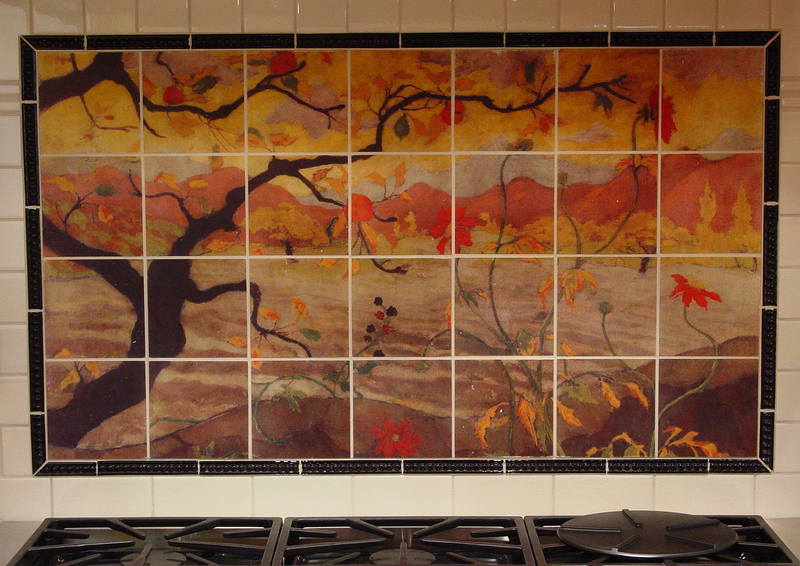 The tile backsplash in this kitchen was custom printed on ceramic tiles for the feature wall behind the range. 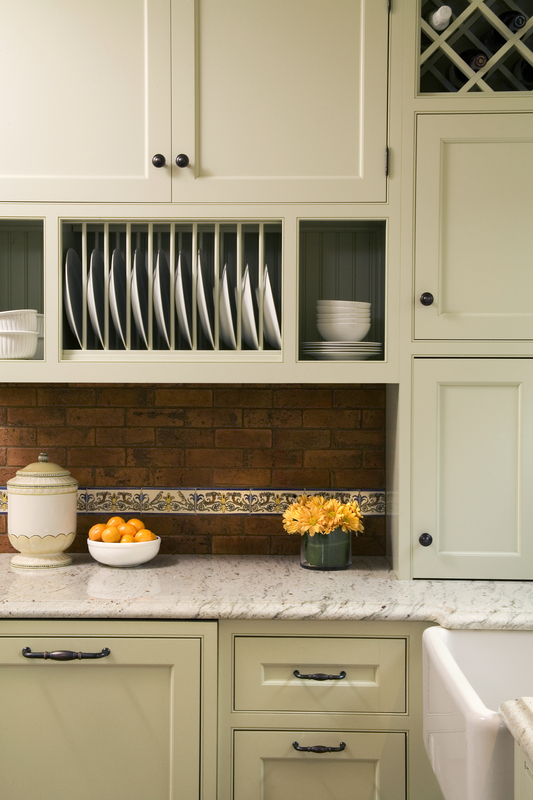 The colors in this print informed the design of the kitchen, tying together bright colors and warm tones to create this one-of-a kind kitchen.